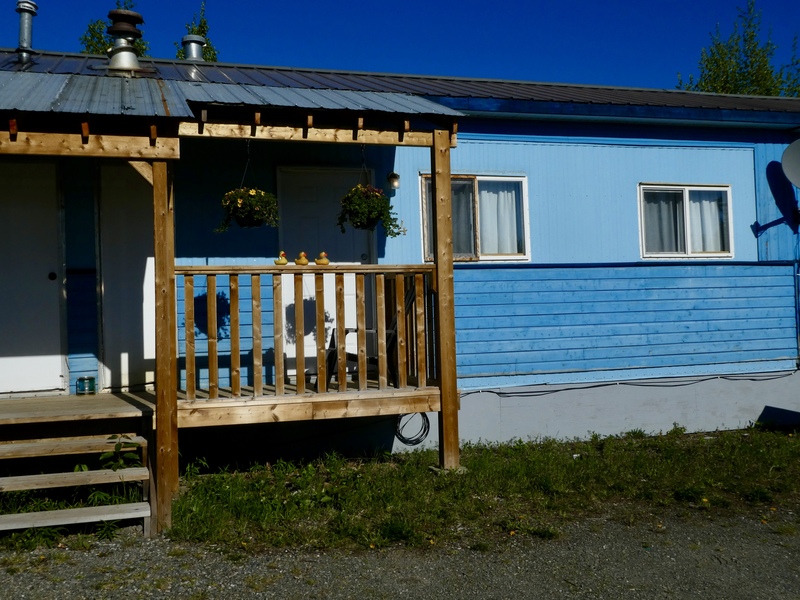 We are in Watson Lake. 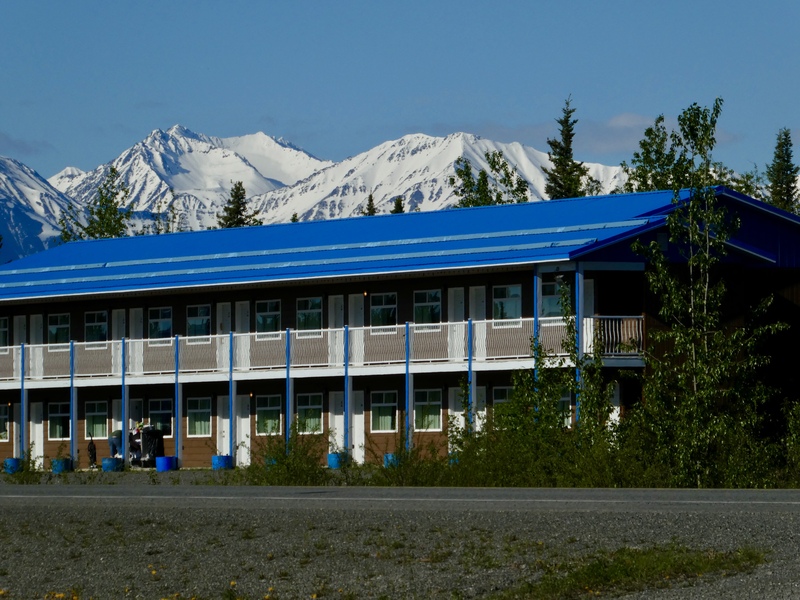 This will be our last community in the Yukon Territory. But what a community! 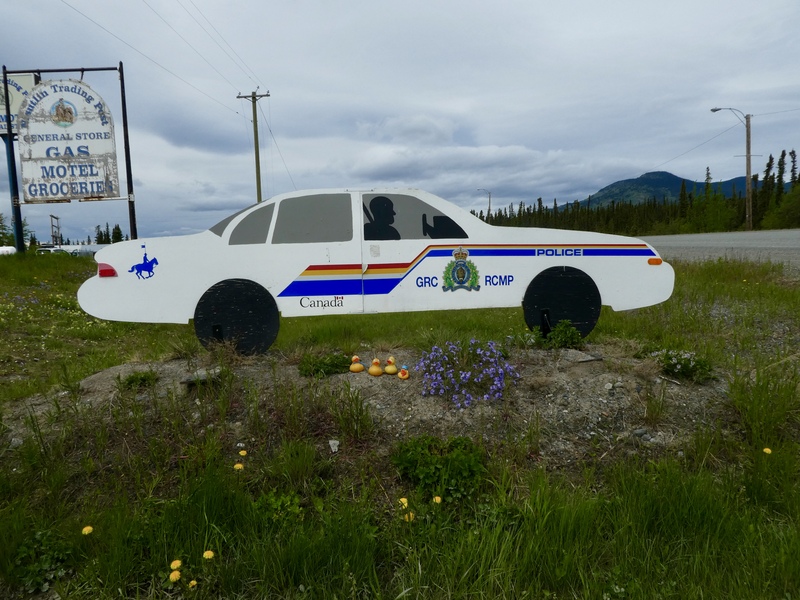 Driving into the community of Watson Lake, we see something unusual. Are these sign posts? Oh yes. Not just a few signs, but so many. 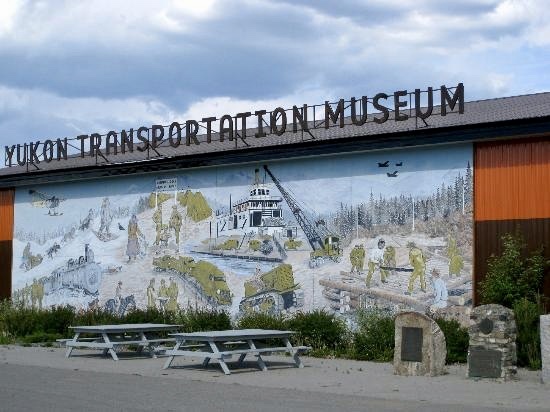 This is Watson Lake’s most famous attraction. 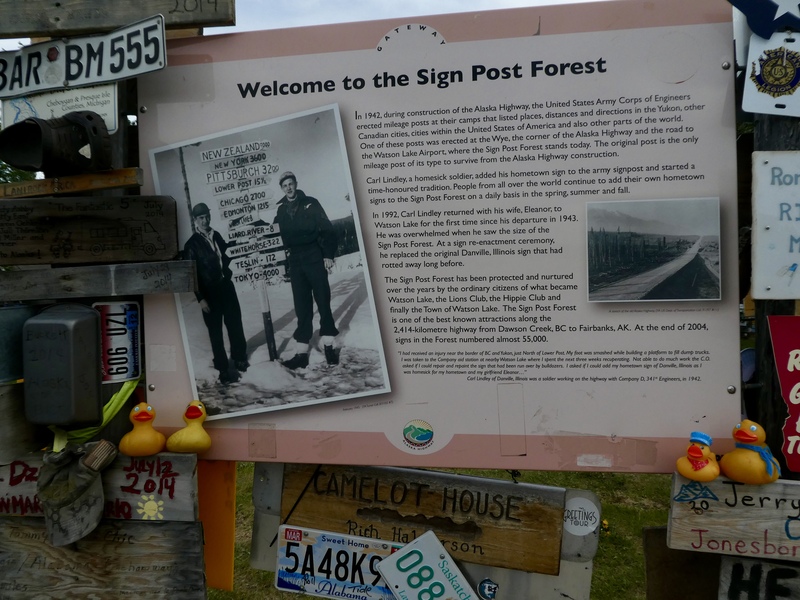 We are at the Sign Post Forest. OK, but why are all these signposts here? This sign explains the beginning. Just think, all these signs are the result of a homesick American from Danville, Illinois. Apparently he was not the only one suffering from a little homesickness. Look at all these signs. 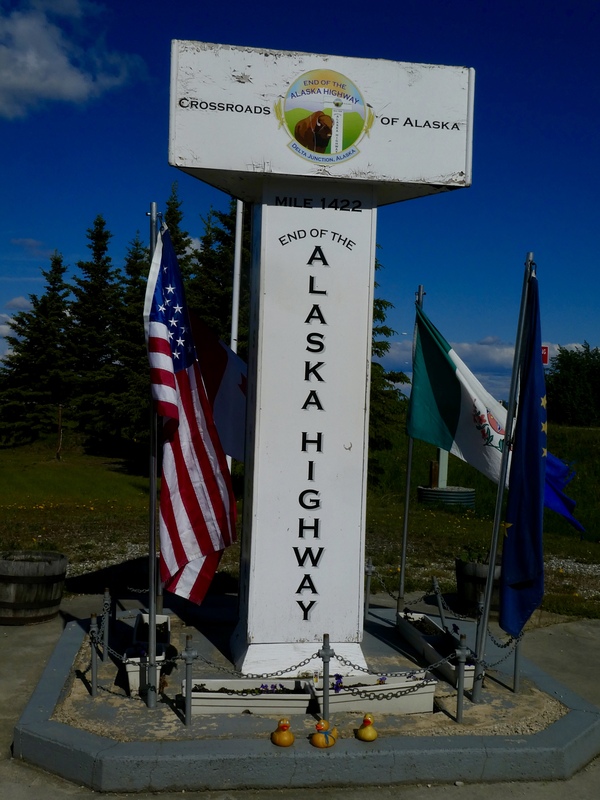 The Alaska Highway was started March 8, 1942. 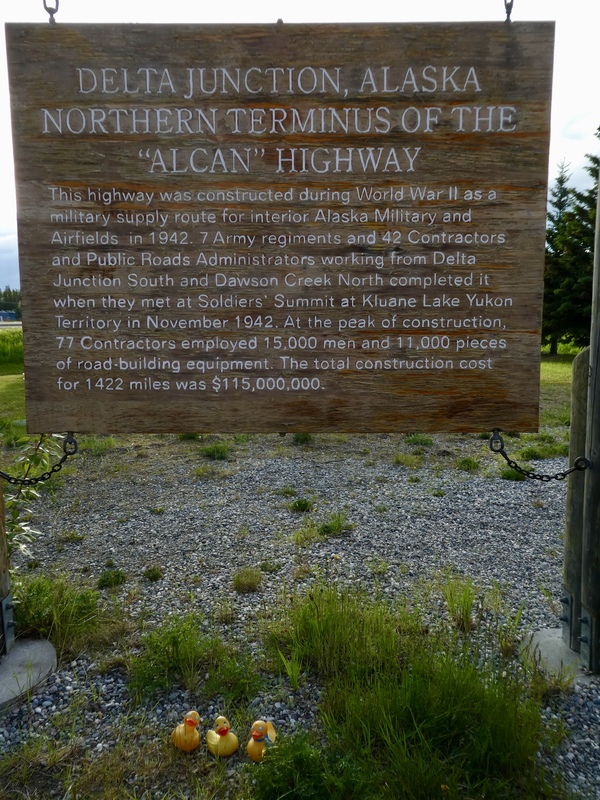 More than 11,000 soldiers and engineers, 16,000 civilians and 7,000 pieces of equipment built this 1,500 mile road through the vast wilderness of northern Canada and Alaska. 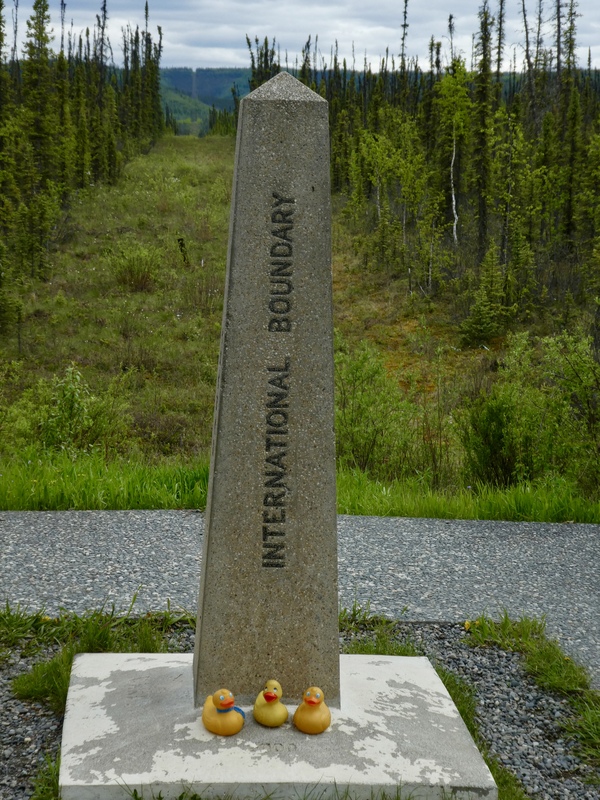 In less than 9 months Dawson Creek, British Columbia and Delta Junction, Alaska were connected. What an accomplishment. Once Carl Lindley put up the first sign, the idea really caught on and everyone started putting up signs. 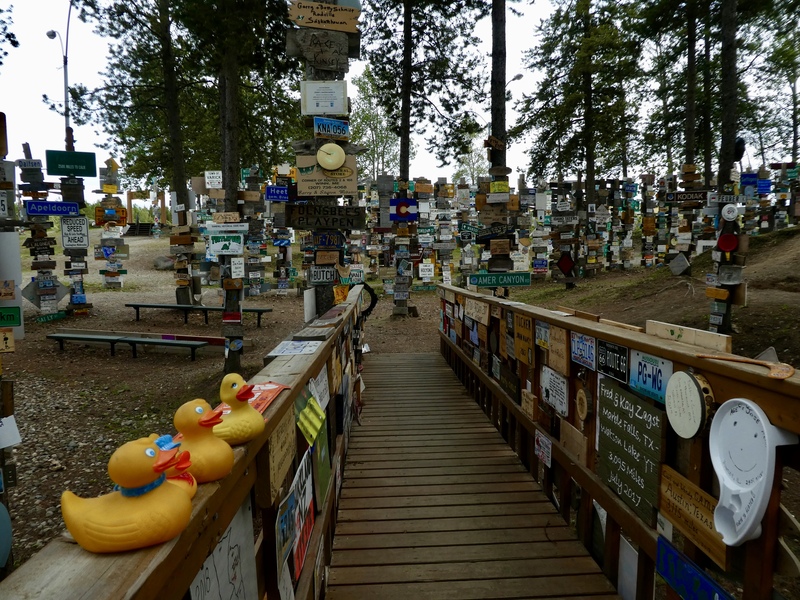 Even with these panoramas, there was no way mom could get photos to show the thousands of signs, everywhere. 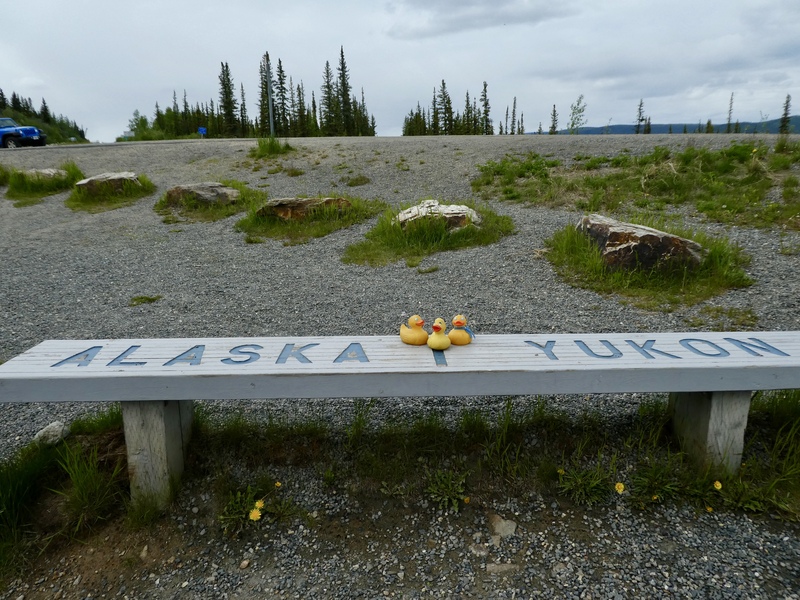 We ducks enjoyed sitting on the bridge and reading some signs. We went to the Visitor’s Center in Sign Post Forest. They were very helpful and so nice. 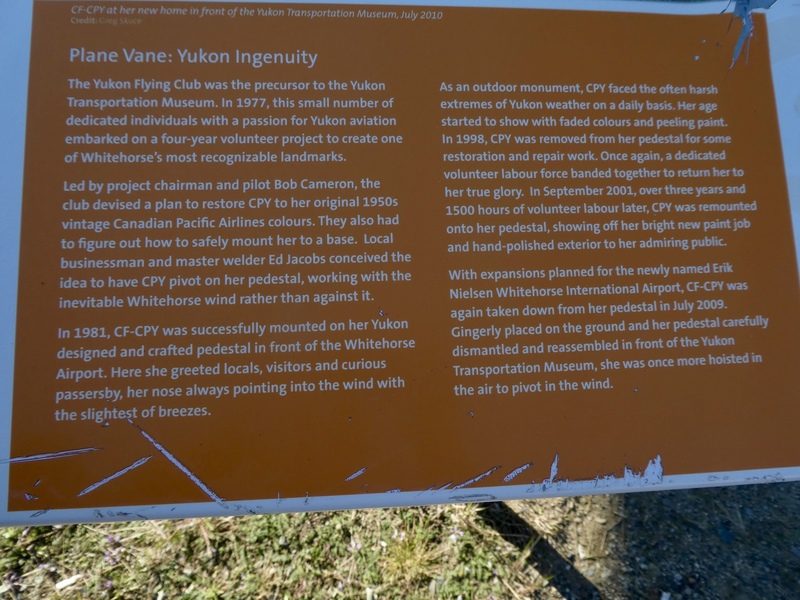 If humans have a sign to add to the forest, the Visitor’s Center will provide a hammer and guide humans to the area where new signs can be placed. Our moms said if we ever come here again, we will bring a sign to add. Leaving the Visitor’s Center, we looked more and are still rather speechless at all the signs. 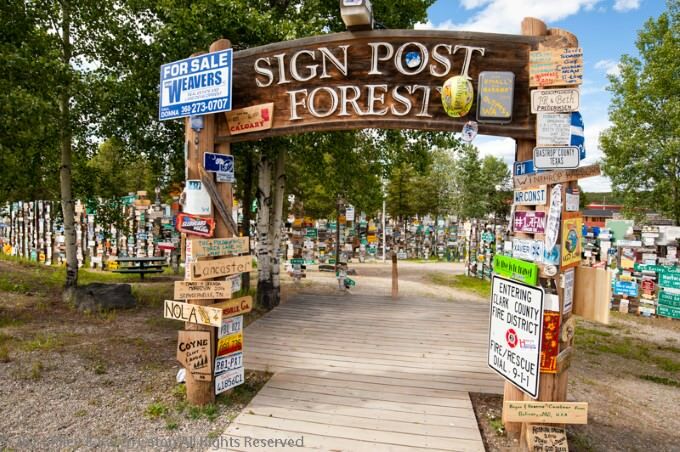 Our guide book says Sign Post Forest is one of The Yukon’s most famous landmarks and contains over 72,000 unique signs. 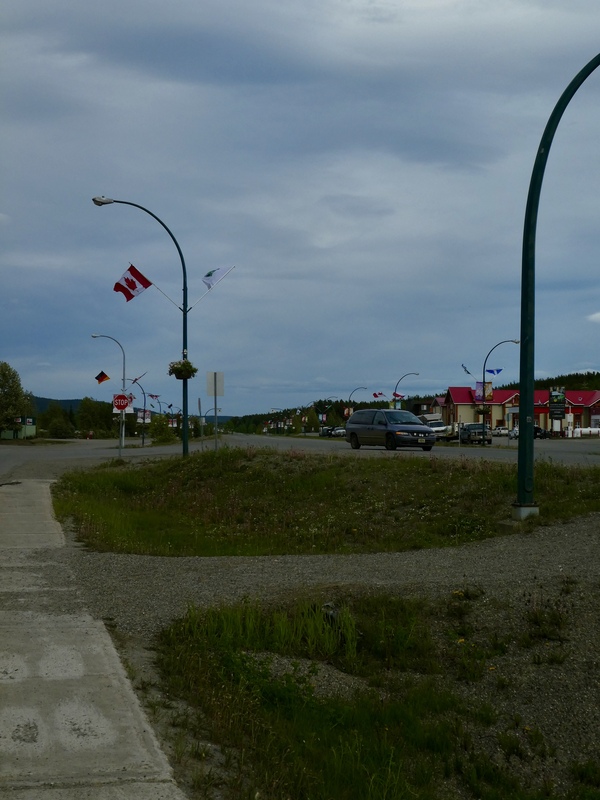 Looking down the main street (The Alaska Highway), we liked the international flags. 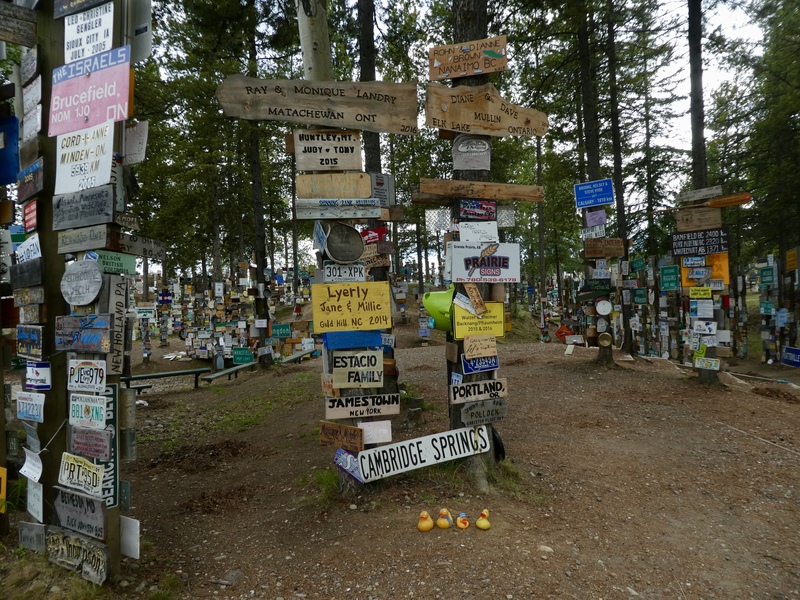 As you can see, Watson Lake is not a large town. 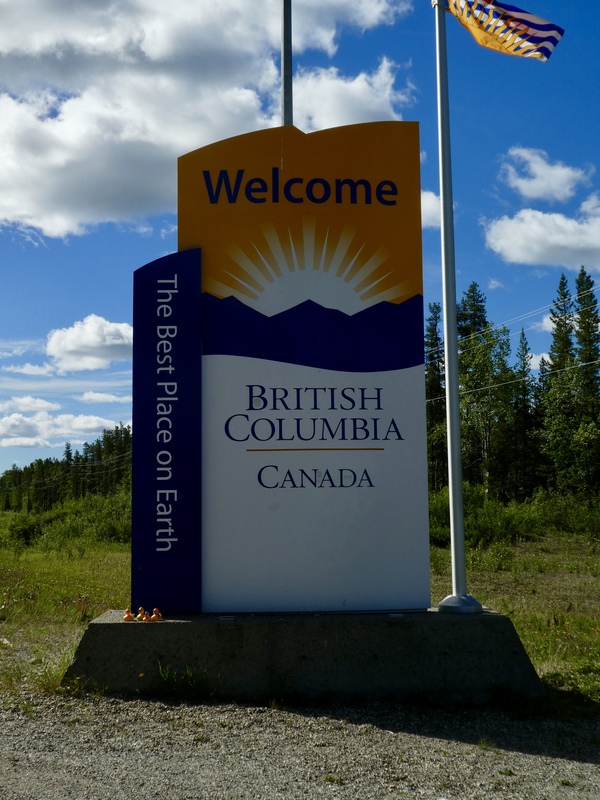 According to Wikipedia, the 2016 census showed a population of 790 permanent residents. Our hotel was clean and comfortable. The restaurant served great food. 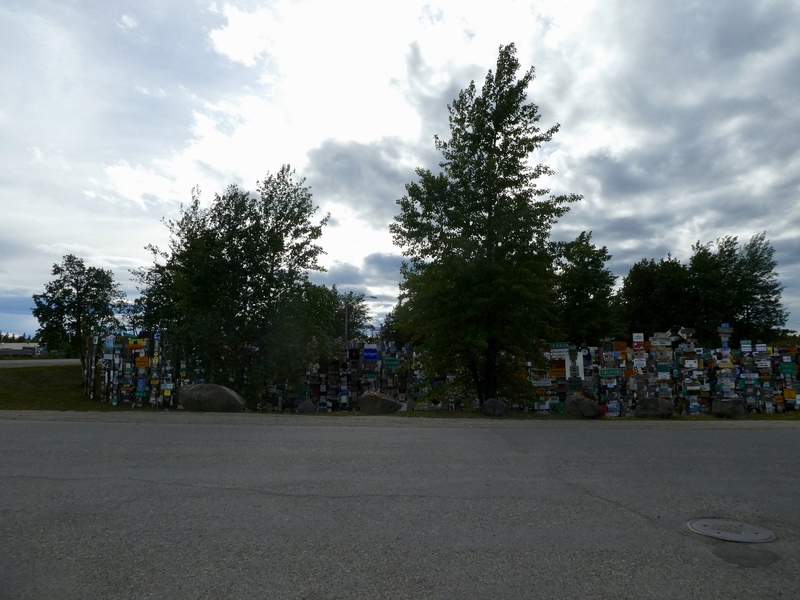 If you are looking for an interesting place to get away from it all, you might like Watson Lake, Yukon Territory, Canada. Heading south in the morning, we once again saw an adorable bear along the road. Of all the bear photos mom took, this just might be her favorite. 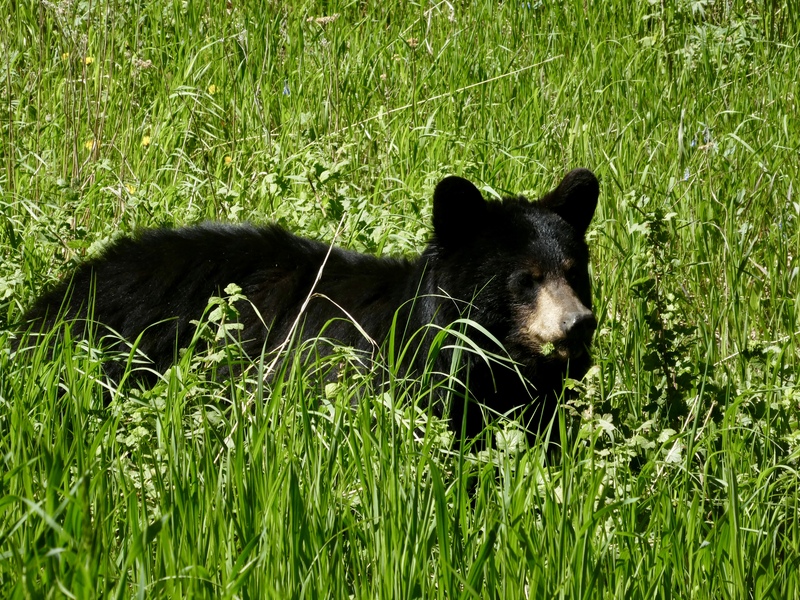 Favorite bear photo. Is he watching us? Isn’t he looking right back at us as we look at and admire him. 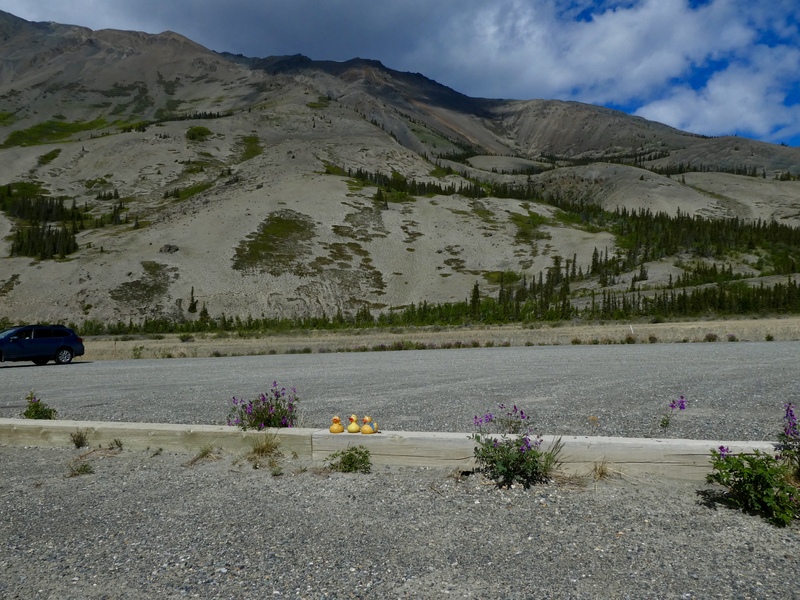 We were thrilled to see bears along the road in the Yukon almost every day. 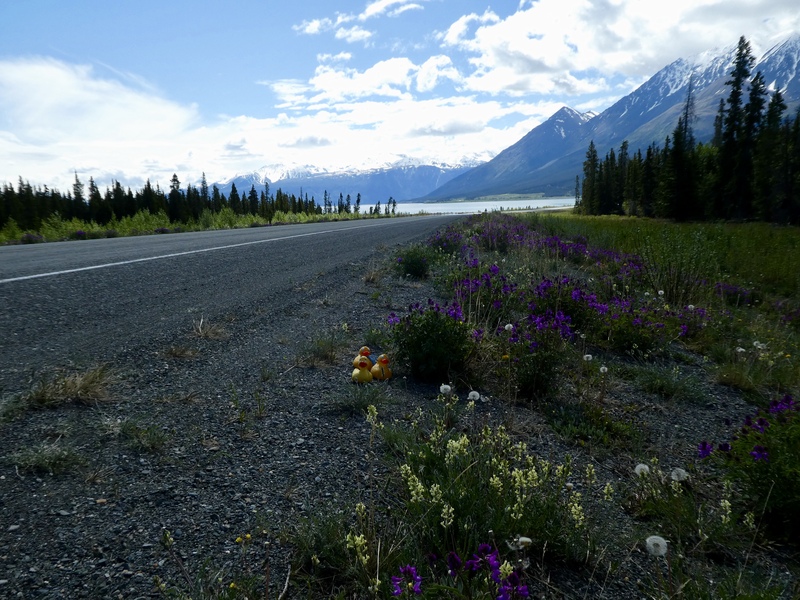 Continuing through the beautiful scenery, we left the Yukon Territory and entered beautiful British Columbia. 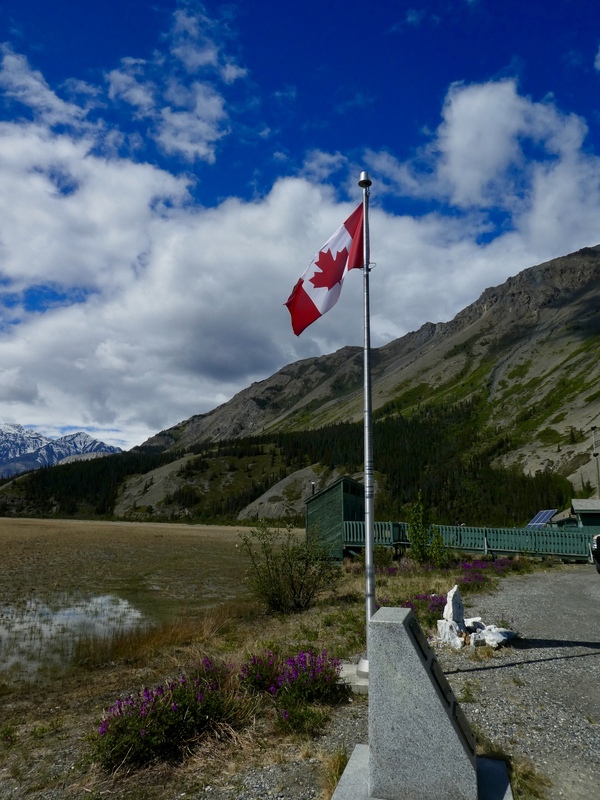 We are enjoying our scenic drive through Canada. 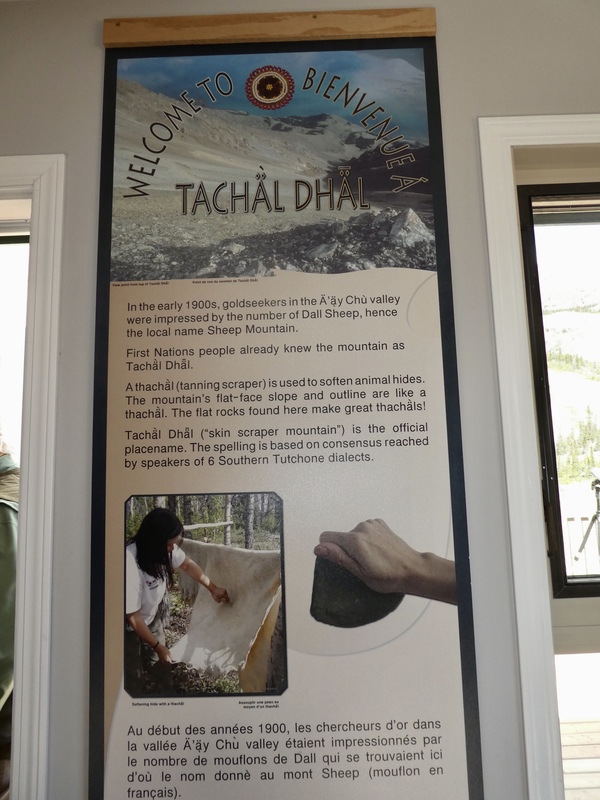 Here in the Canadian Yukon Territory, we discovered a Heritage Center and it is located on beautiful Teslin Lake. 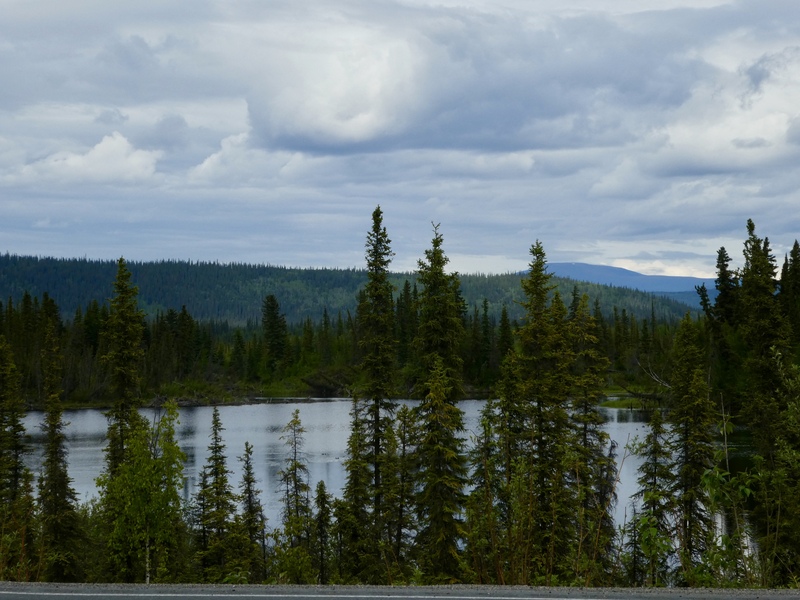 The Yukon is beautiful! 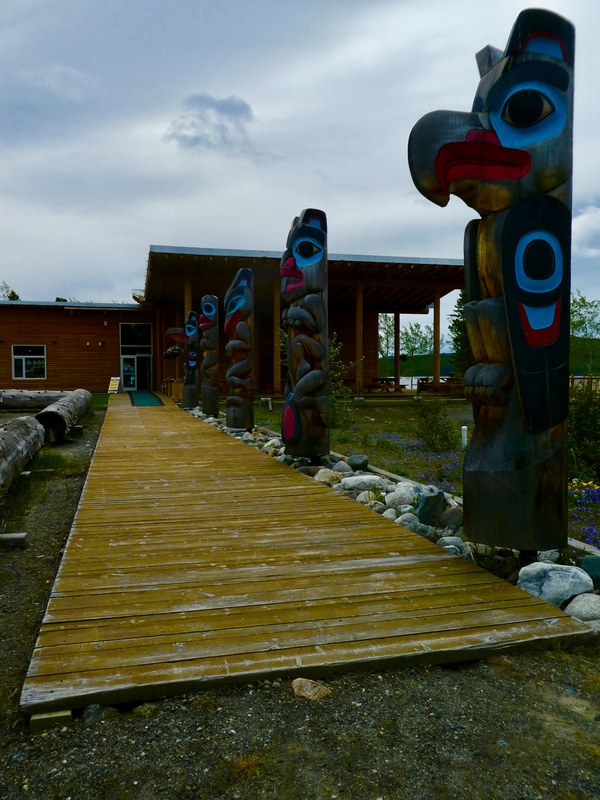 Let’s stop and explore the Teslin Tlingit Heritage Center. It was cool and cloudy, so the walk to the entrance is rather dark. 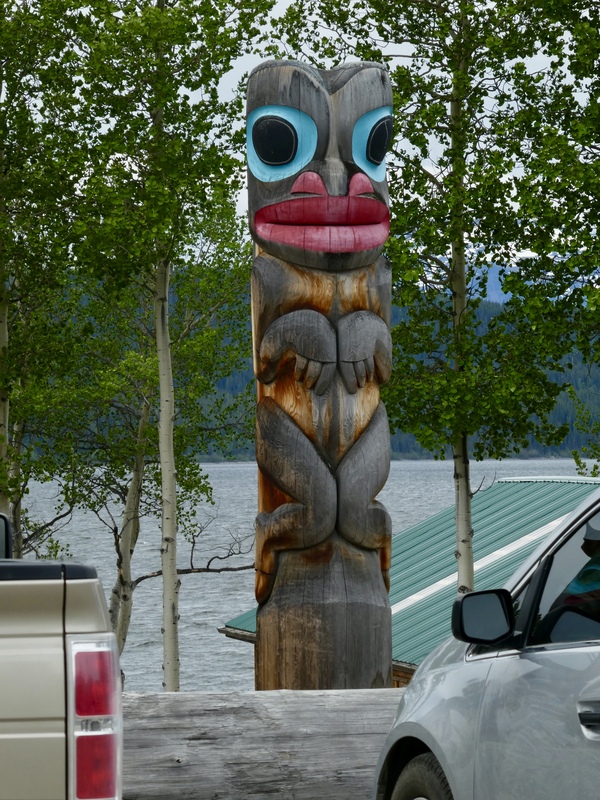 But we loved these totem poles. 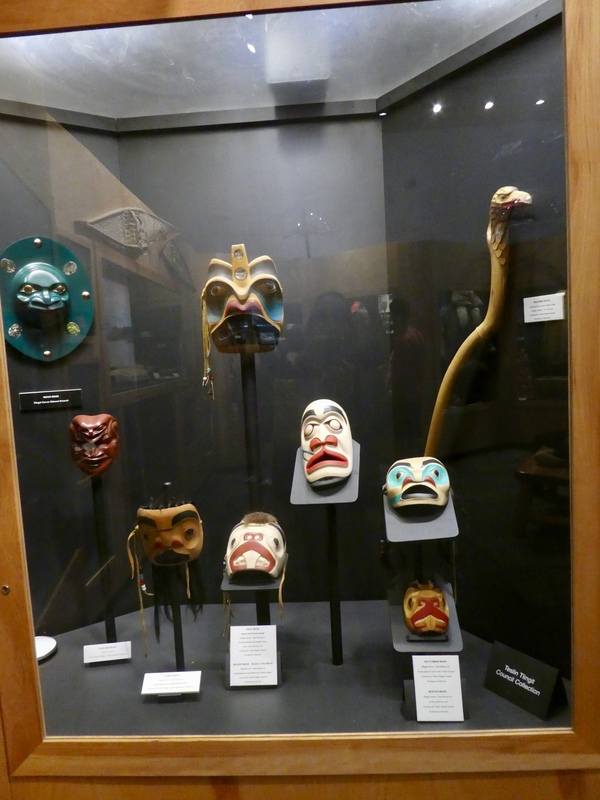 If you have visited southeast Alaska, you may have seen some items from the Tlingit Indians. 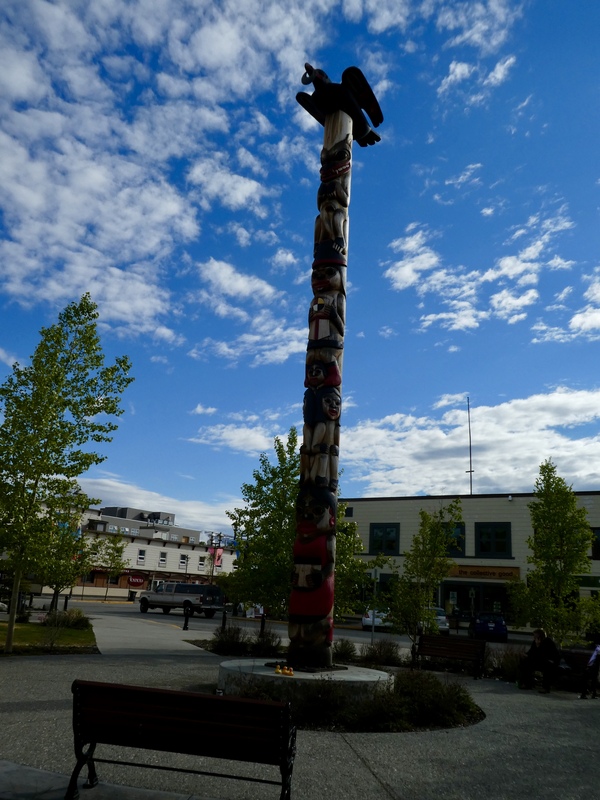 There are many totem poles in Ketchikan, Alaska and other Alaskan towns. Entering the Heritage Center, we stopped to look in the gift shop. 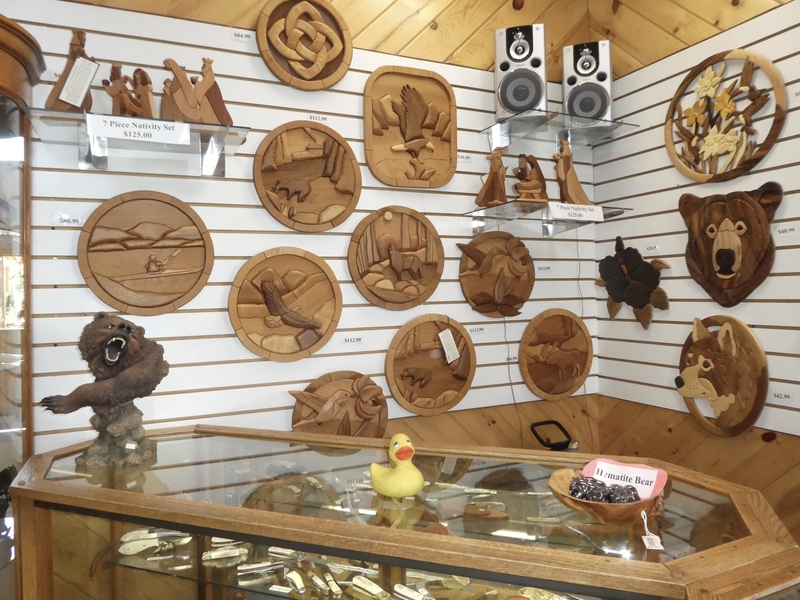 They have many beautifully made items, but we wanted to see the exhibits here. These masks are fantastic. Remembering that -40 temperatures are common, we really liked the furs. 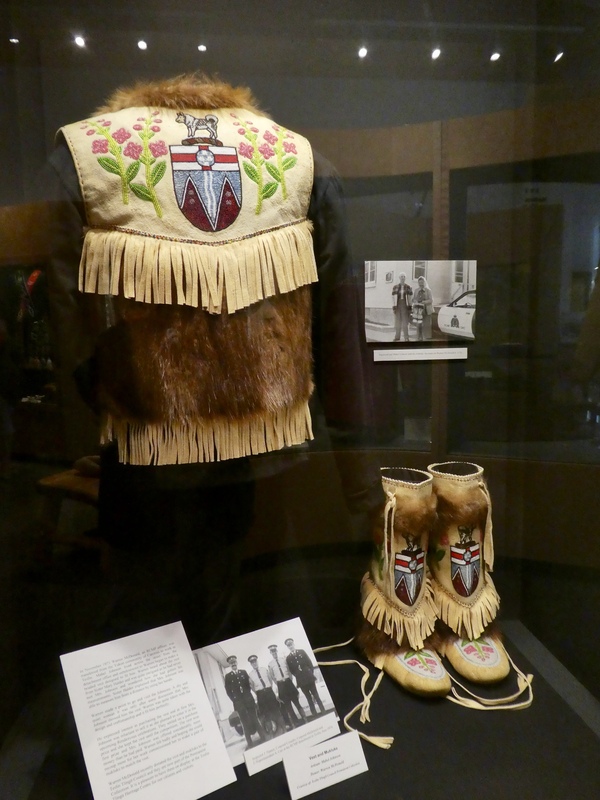 We would love those boots in our Colorado mountains. Of course, other items are also needed. Things must be hand made. No nearby shopping mall. 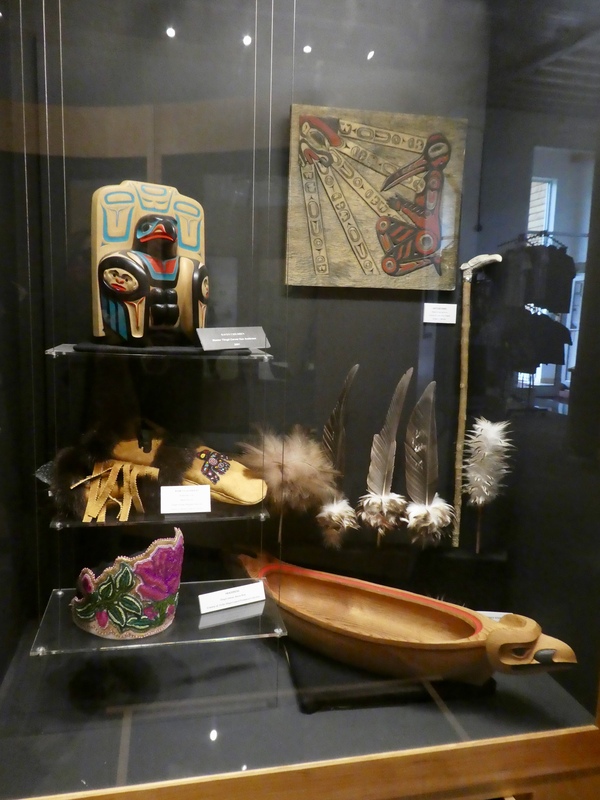 There were so many fascinating exhibits and we hope you visit here. But the setting of the Heritage Center is breath taking. 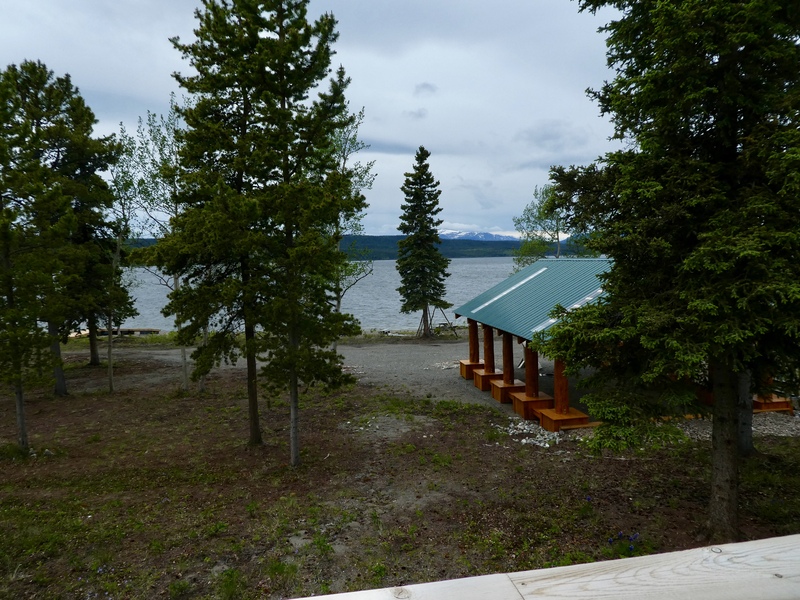 From the back of the center, you can access the lake and enjoy a picnic. Or just sit and admire the view. The view from the side is equally beautiful. And the building has beautiful large windows for year around viewing. 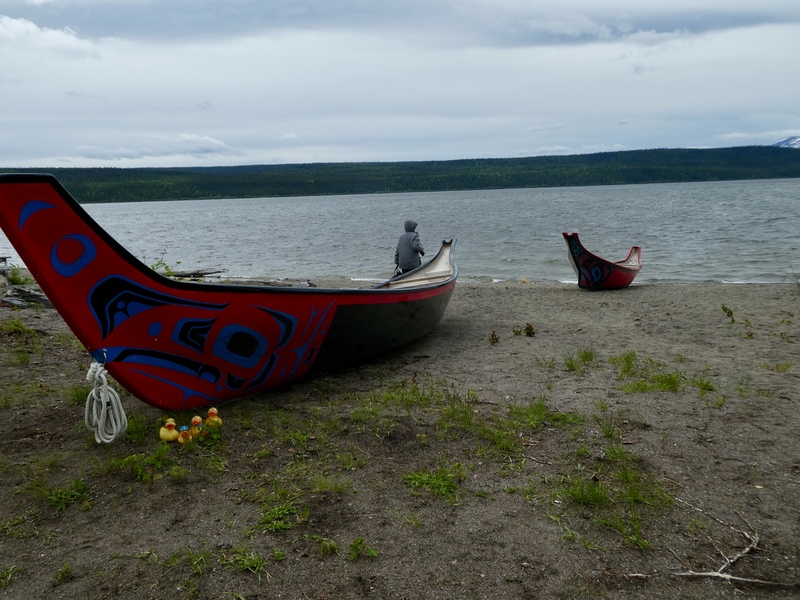 We love these canoes. Aren’t they large and attractive? Too bad no canoe rides for us today. So many picnic tables and areas here. 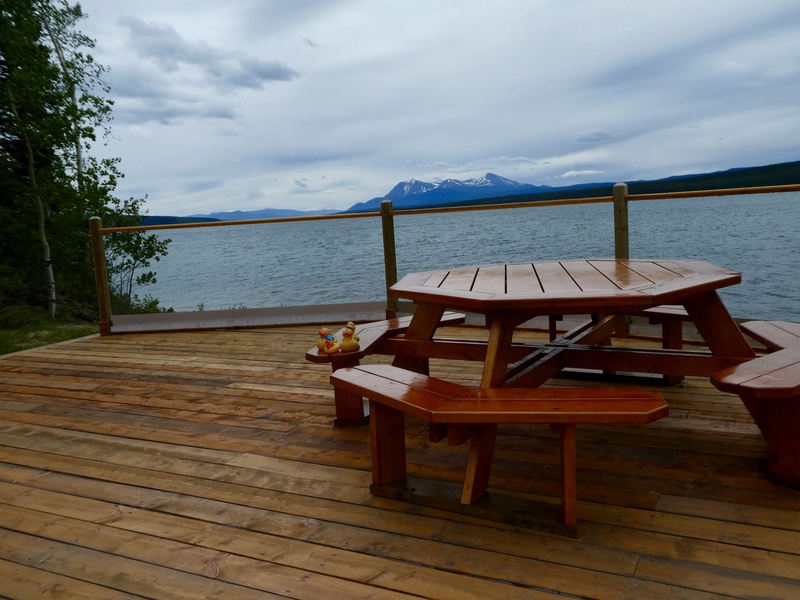 This is perfect and so many people can enjoy the lake and the beautiful Yukon views. 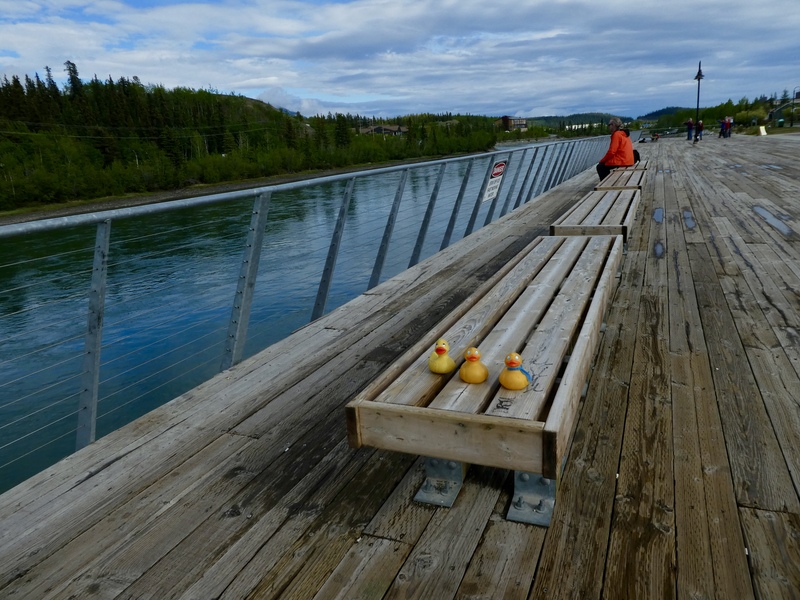 Ducks and humans are so in awe of the beauty of nature here in the Yukon. 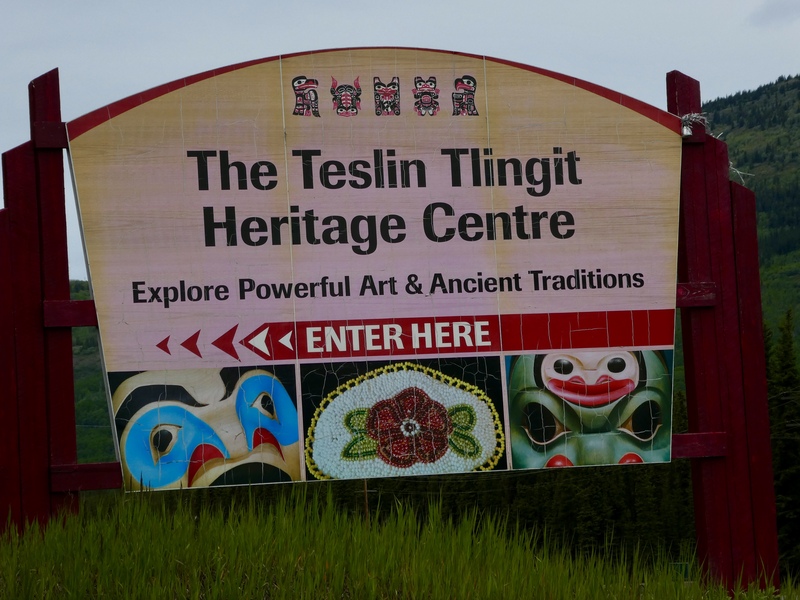 A few miles south of Teslin Tlingit Heritage Center is Nisutlin Trading Post and Motel. 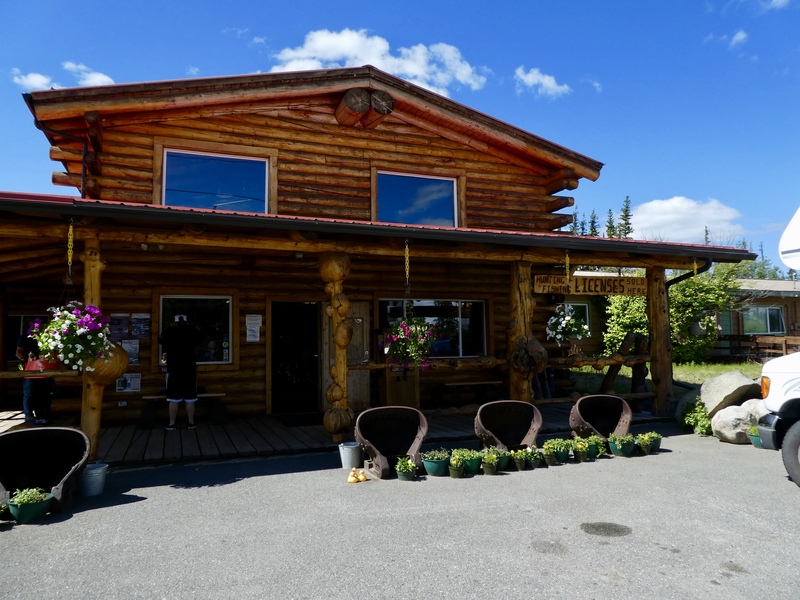 Of course, we, like most drivers on the Alaska Highway, stop for gas at every gas station. You never know if the next one is open or if it has gas. This police car is great and the officer looks so real from the road. No speeding here. 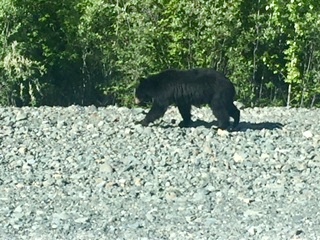 We loved our time outside today, but our favorite Canadian was enjoying a snack along the road. 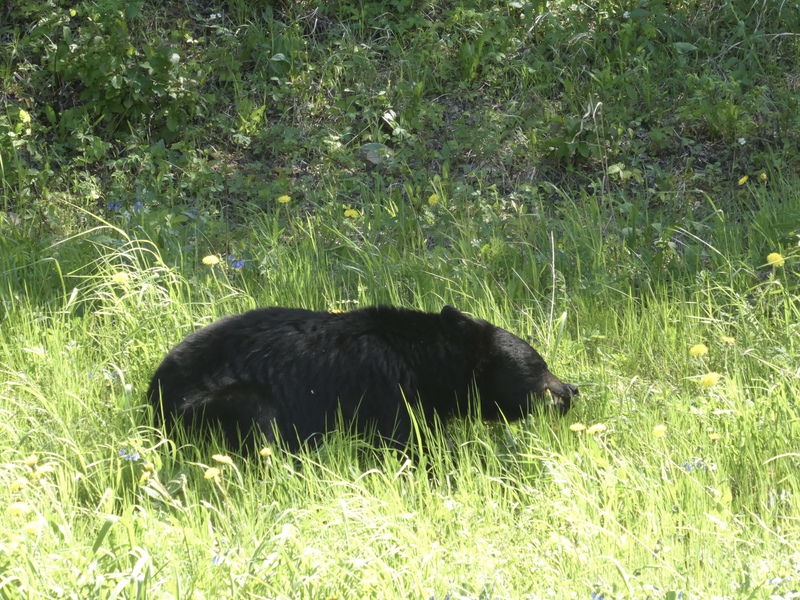 We saw a bear about every day and we always pulled over to watch them eat and admire them. This drive is beautiful. 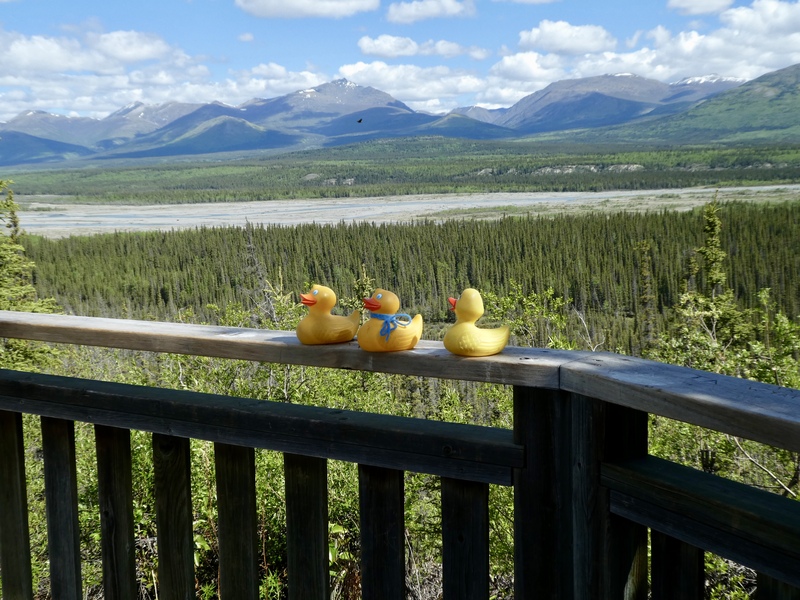 And both relaxing and invigorating with the incredible Yukon scenery. 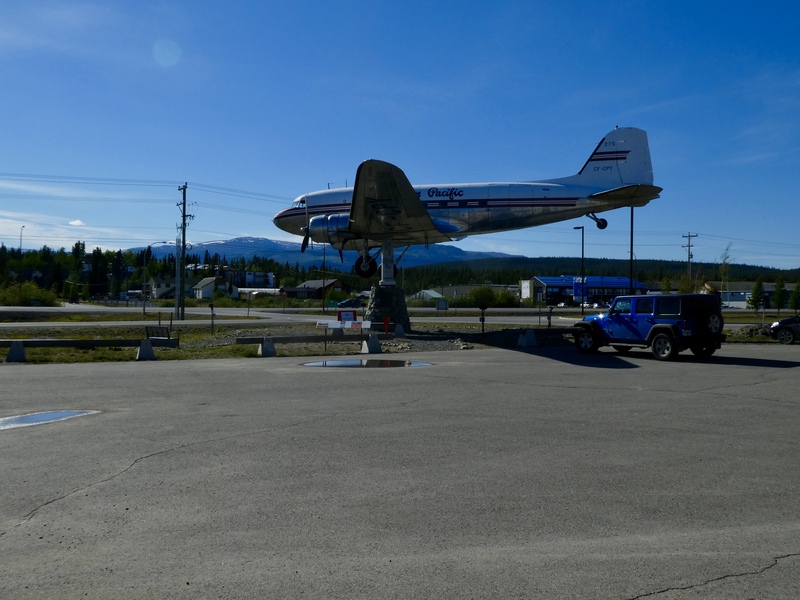 A short walk and here we are at the Yukon Transportation Museum. After paying our admission fee, we wandered through the gift shop. Soon you will see what we bought. Focusing on transportation here, we immediately were attracted to this canoe. 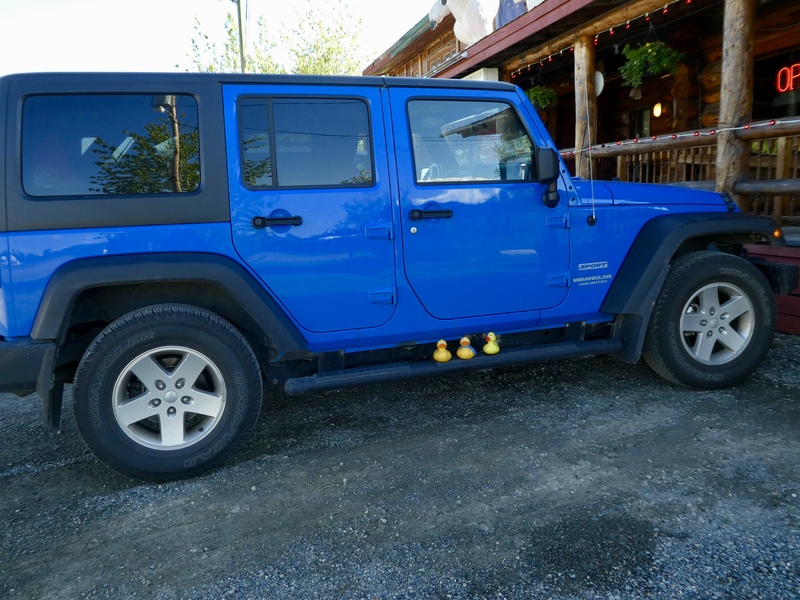 Yes, there are now 4 Colorado Traveling Ducks. 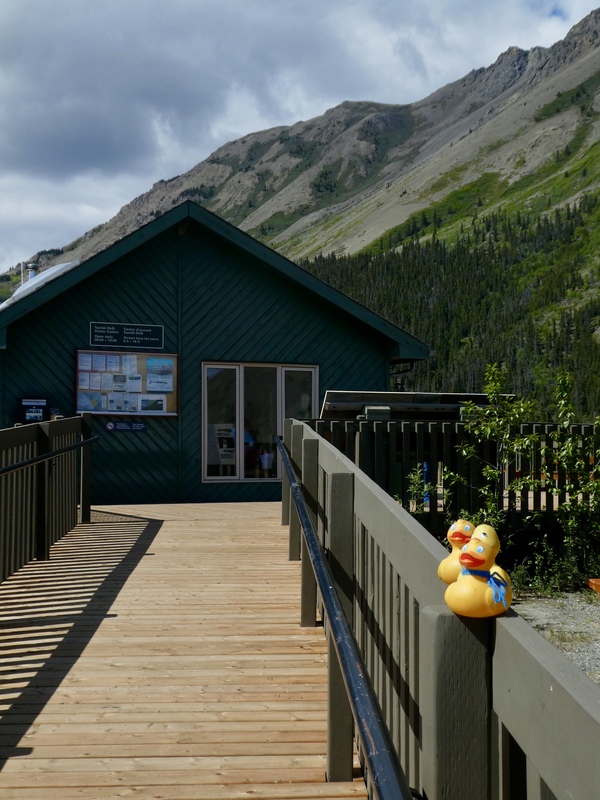 Our newest addition is an engineer for the train, but we call him Yukon Duck. 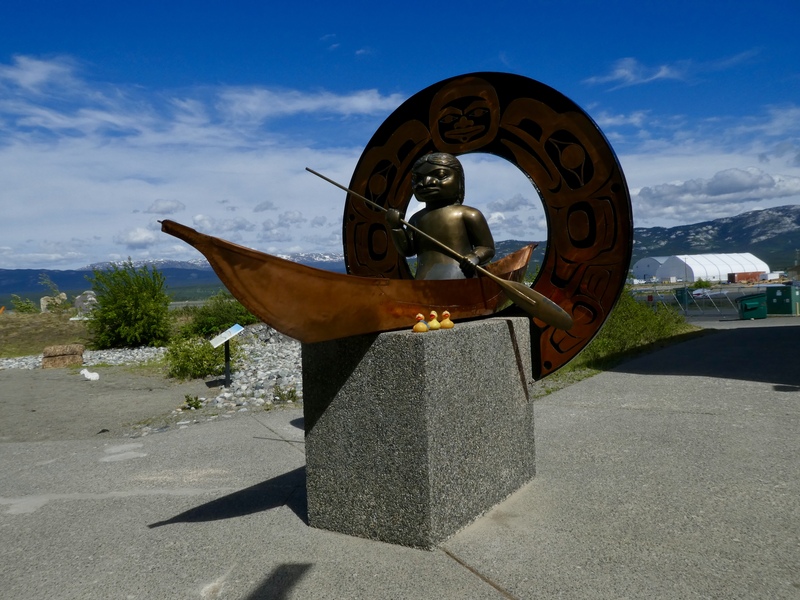 During the Klondike Gold Rush of 1898, the train connected Whitehorse on the Yukon River with Skagway, Alaska. 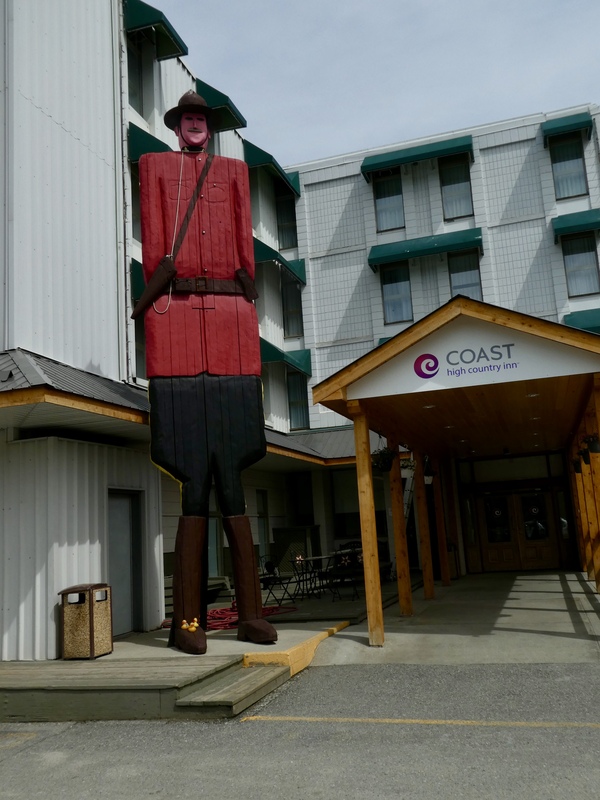 Skagway is a little over 100 miles away and is a seaport. 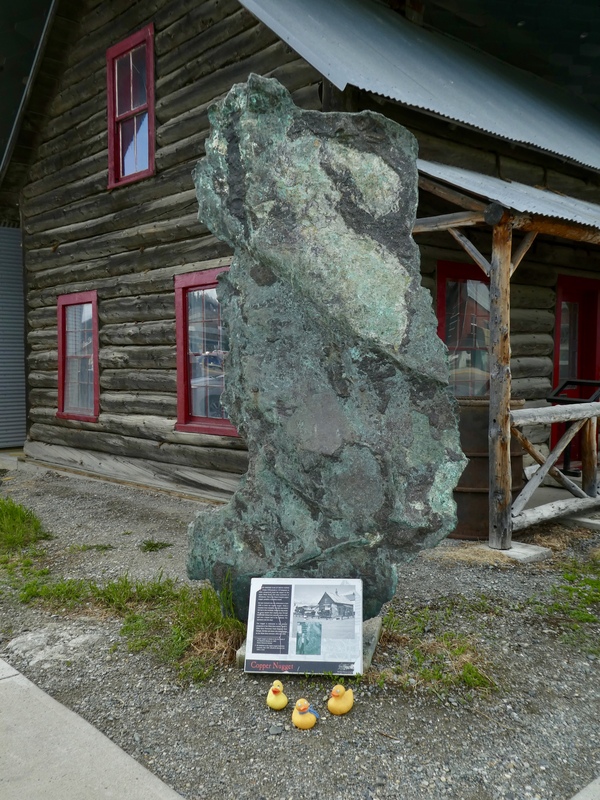 Miners needed to get supplies and gold was often shipped out of Alaska. 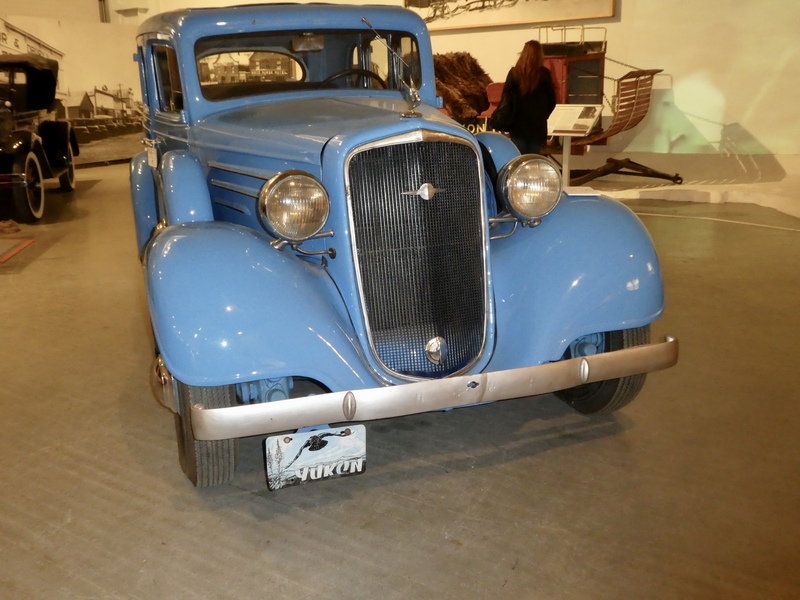 Here is an early car for the Yukon Territory. Most of the year it is winter here, so travel was done by sled. Conditions were not safe for travel if the temperature was -40 (the same temperature for F and C). How to know if it was too cold? A bottle of Perry Davis Pain Killer was placed outside by the window. If the bottle became frozen, it was “too damn cold for man or beast.” We ducks don’t want to be out when it is -40. 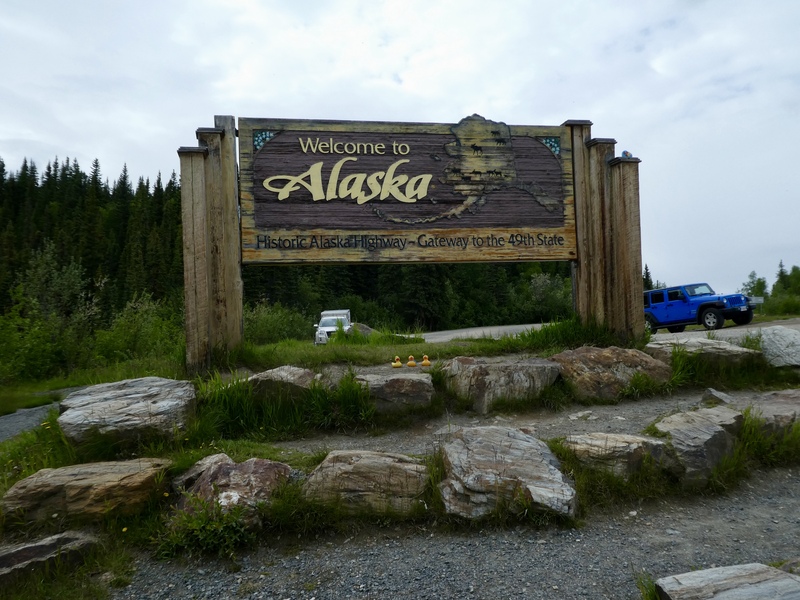 There is more than one famous dog sled race in the area. 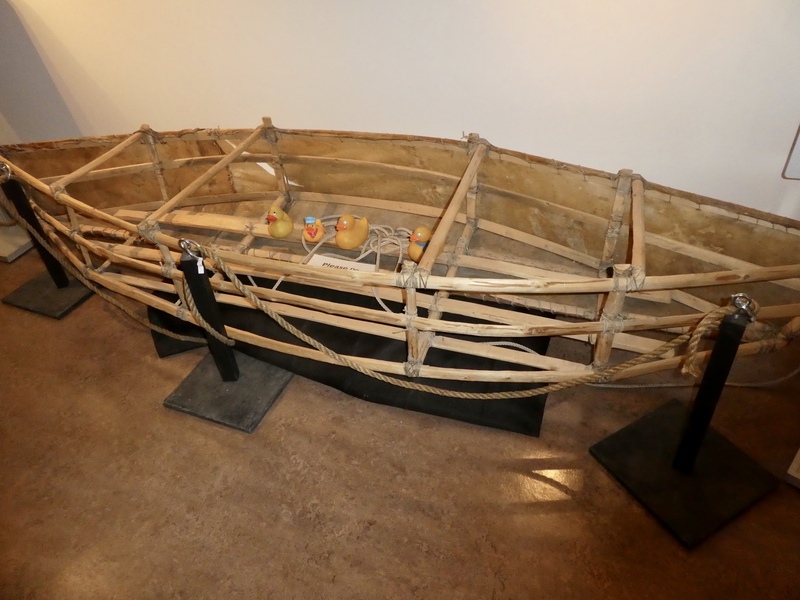 This sled is from the Yukon Quest. 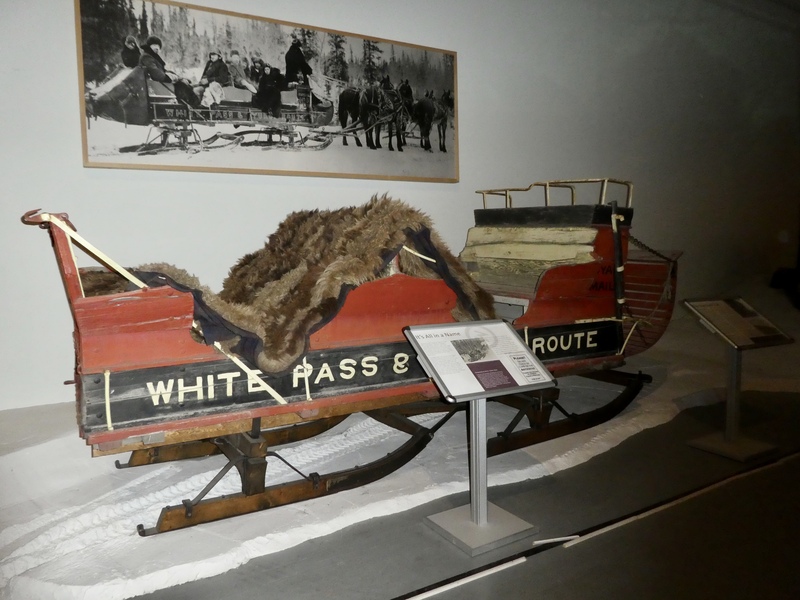 The race is between Whitehorse, YT and Fairbanks, Alaska. 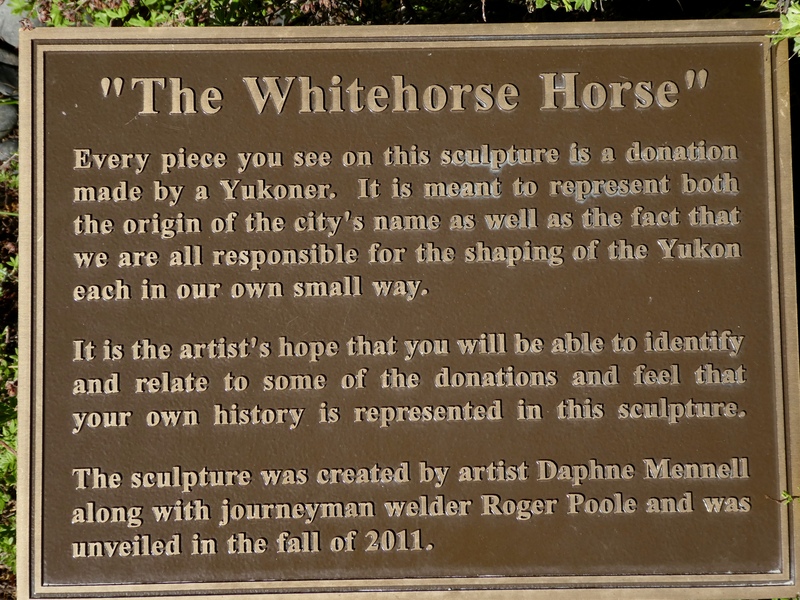 The starting point alternates between Whitehorse and Fairbanks each year. Spectators can see the beginning one year and the finish the next. This exhibit was something new to us. 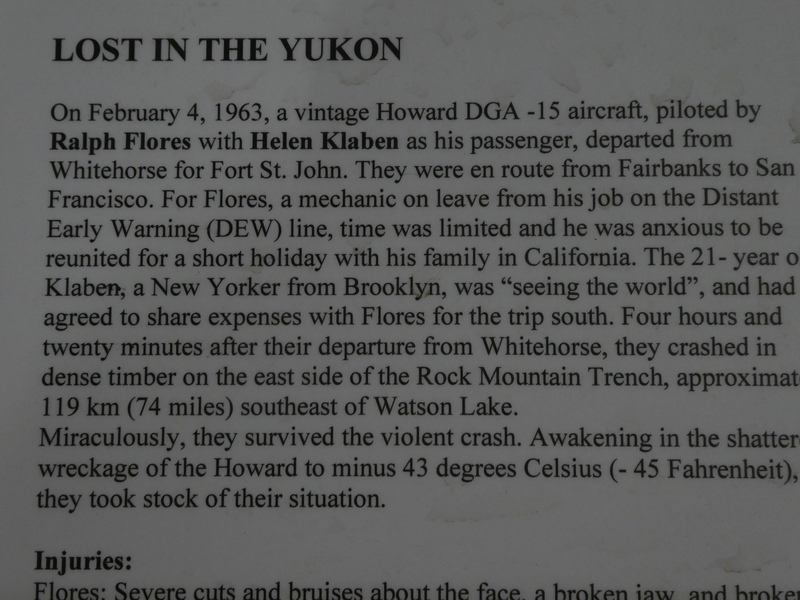 Lost in the Yukon was about a plane crash in 1963 and a great survival story of two people. These two, Ralph Flores and Helen Klaben survive for 49 days. 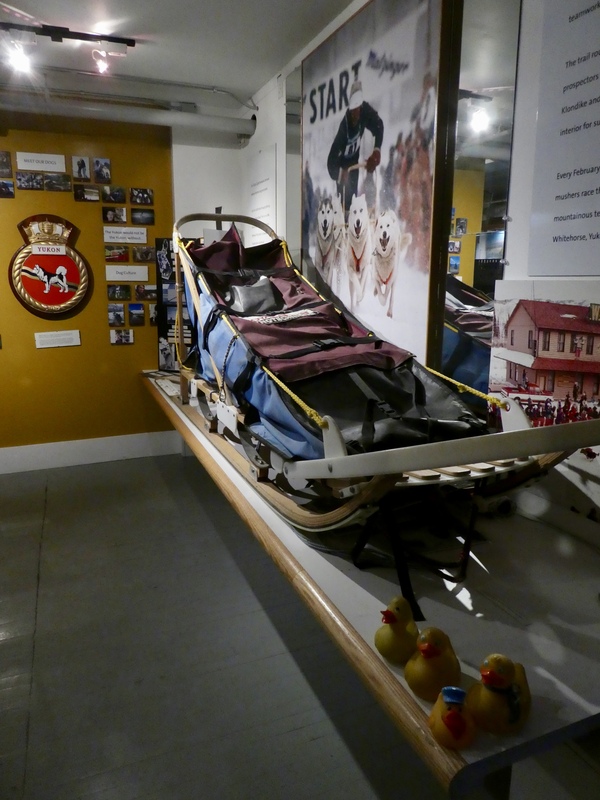 They endured painful injuries, starvation, weeks of -40 or colder, and the long dark Yukon winter. In March, Ralph stomped SOS on a frozen snow covered swamp. The SOS was seen and they were rescued March 26, 1963. In 1975 Helen wrote a book about the survival titled, “Hey, I’m Alive” A movie was also made in 1975. Maybe we will watch it this winter?? 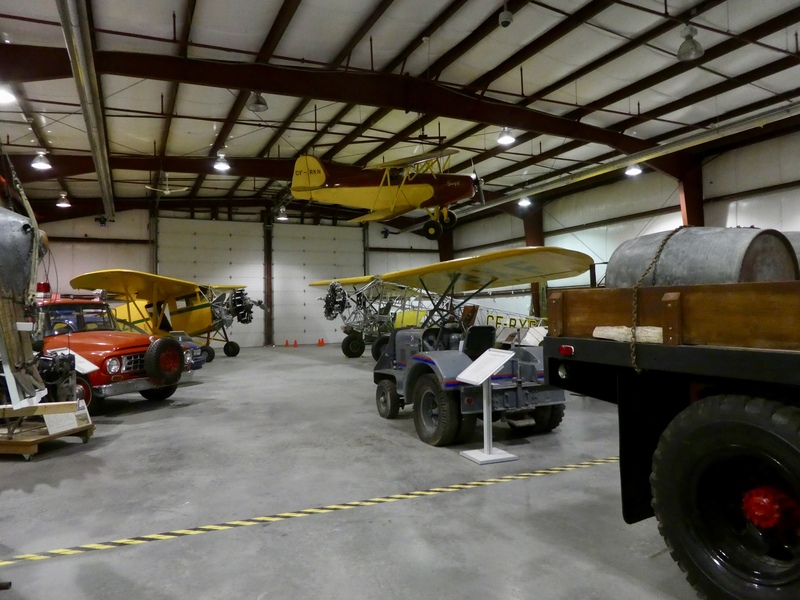 In the airplane hanger, we admired many airplanes. 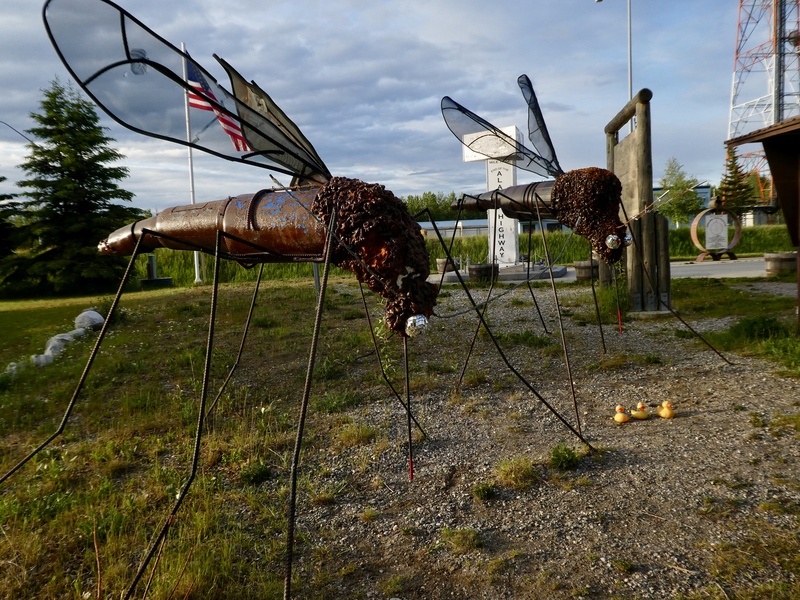 Flying is often the only way to travel in the far north. We liked this helicopter, also. 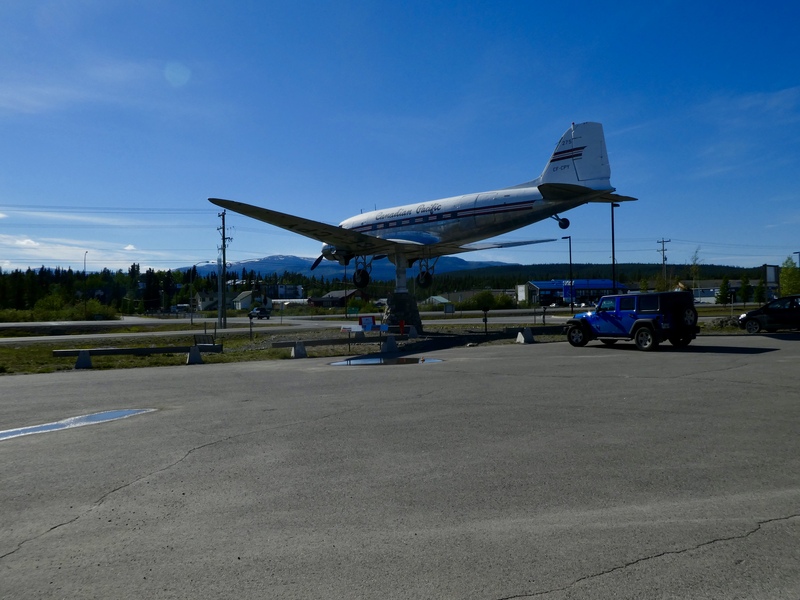 The Yukon Transportation Museum is next to Whitehorse International Airport. We we impressed by the Plane Vane. This sign explains it best. 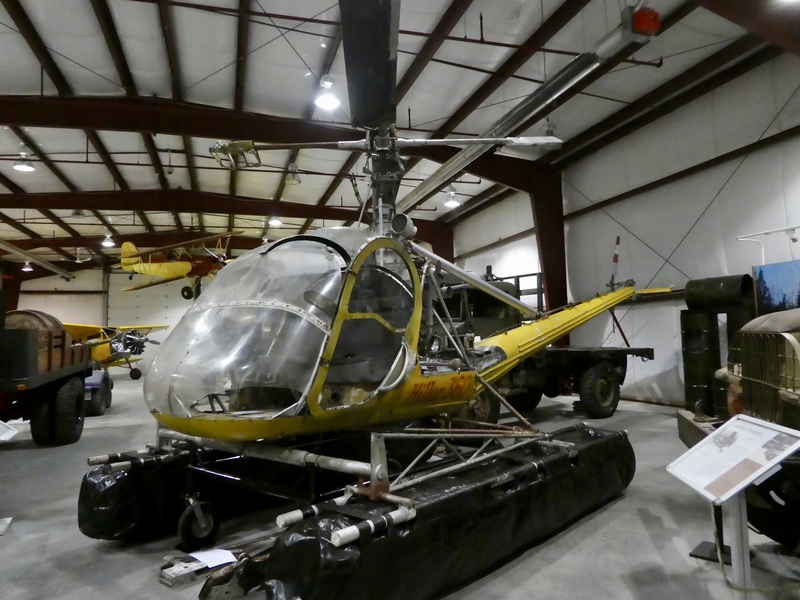 A real plane with a long history and now a weather vane. We want to show you that it really does move. It was not very windy the day we visited, but you can see from these 2 photos that the plane did move. 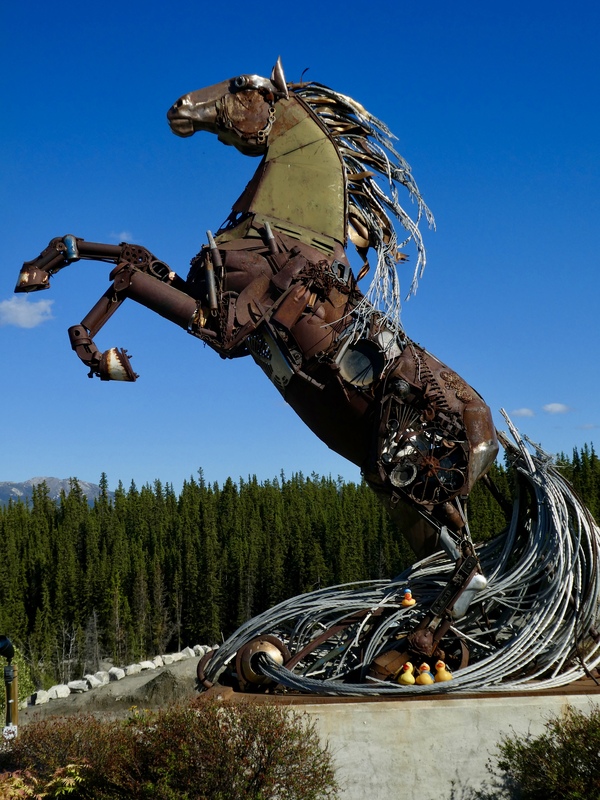 According to http://www.RoadsideAmerica.com this is the world’s largest weather vane. We are getting hungry. After a great day in Whitehorse, it is time for dinner. 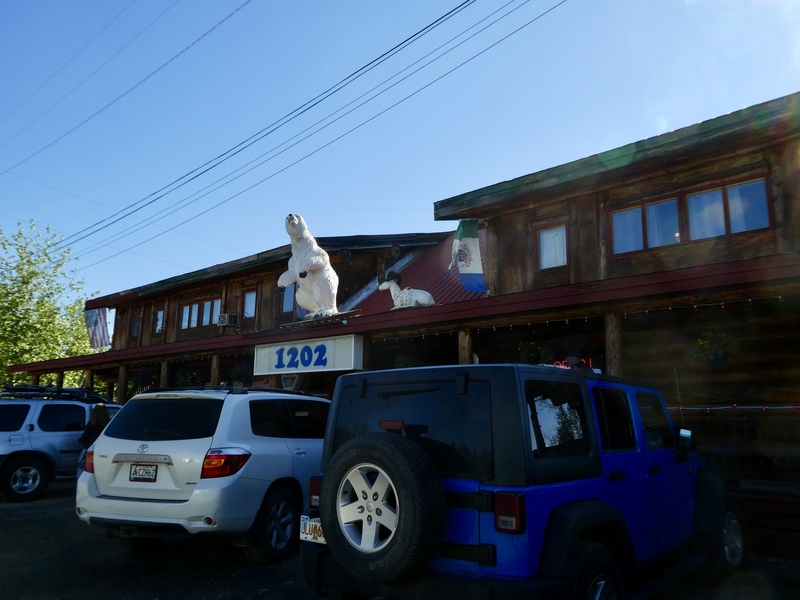 Klondike Rib and Salmon restaurant is next to our hotel. The reviews were great and the food was fantastic. The humans ordered salmon and also halibut. Both were very fresh and cooked to perfection. Humans and ducks loved it. 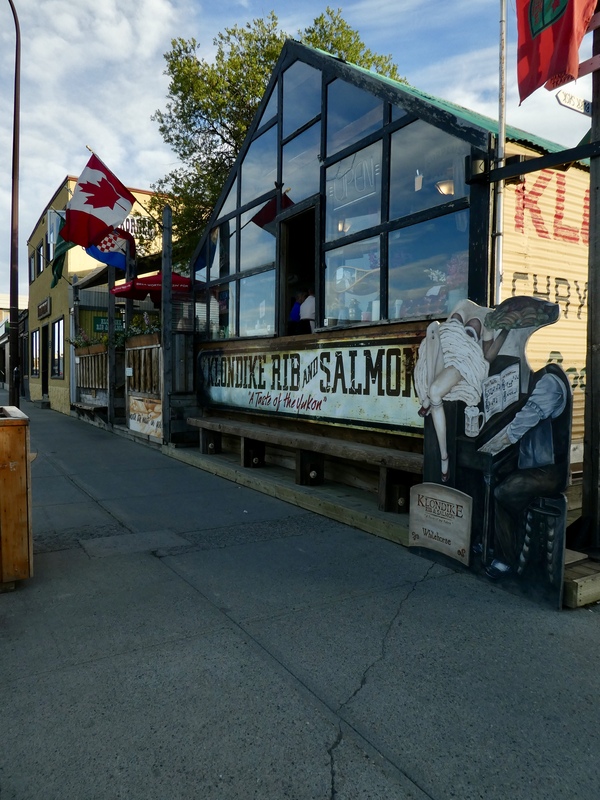 The restaurant is housed in the 2 oldest operating buildings in the Yukon Capital. The menu had a history of the building. The dining room was originally opened as a tent frame bakery called, MacMillian’s Bakery around 1900. 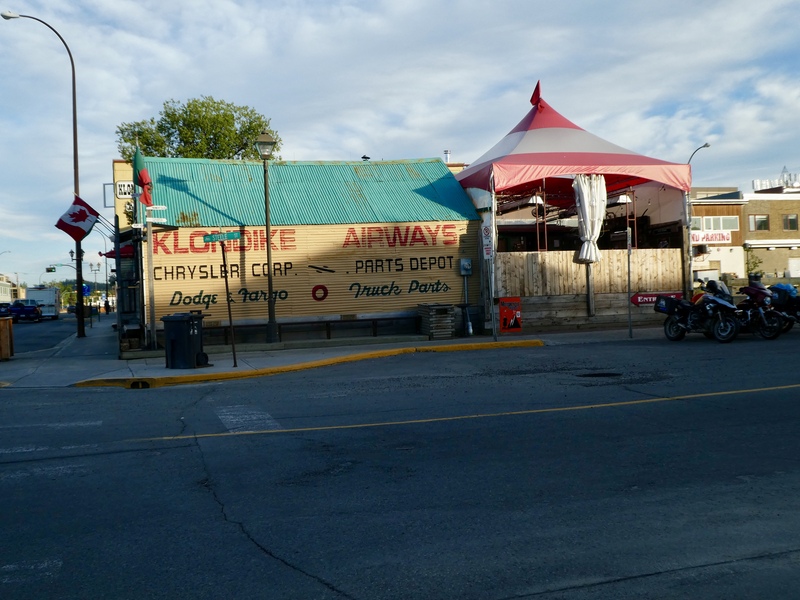 The main building was Klondike Airways, a mail and flight business. 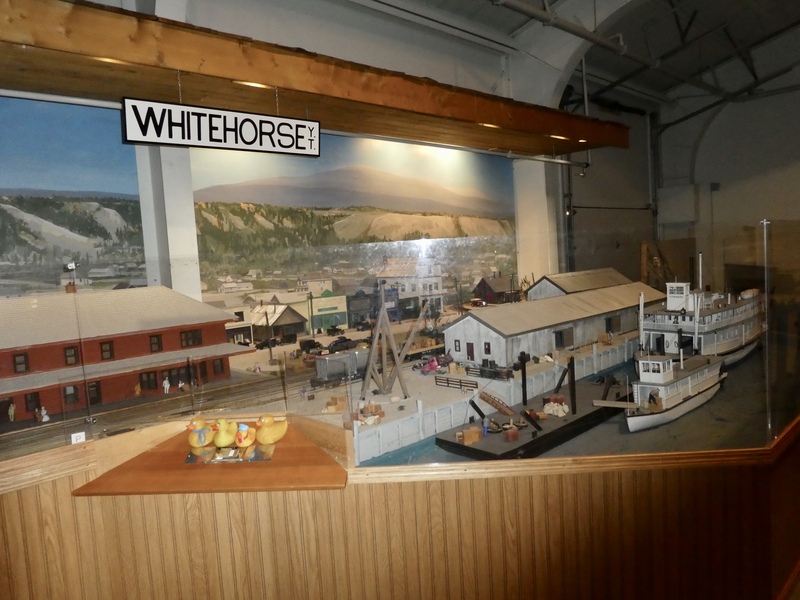 In the 1930’s the building was used as a carpentry shop and coffins were constructed for a mortuary in downtown Whitehorse. Today we have this Quaint Little “Northern Klondike Theme Restaurant.” With winters of -40, this little wall tent buttons up in the fall and goes into hibernation each year until Mother’s Day. We ducks like menus that tell us about the restaurant, so this is a favorite with us. There really is a tent area of this restaurant. Great in the summer, but too cold in the winter. 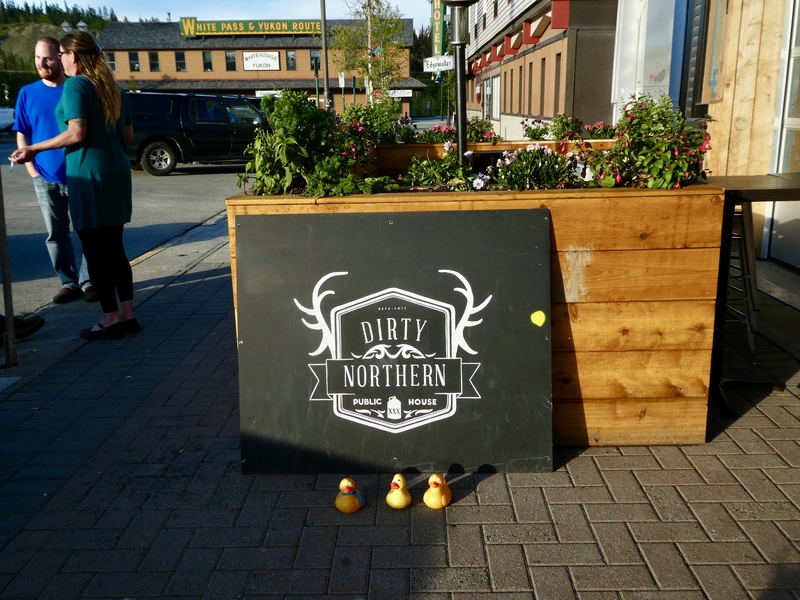 This was a great day in Whitehorse, and we welcome Yukon Duck to our duck family. 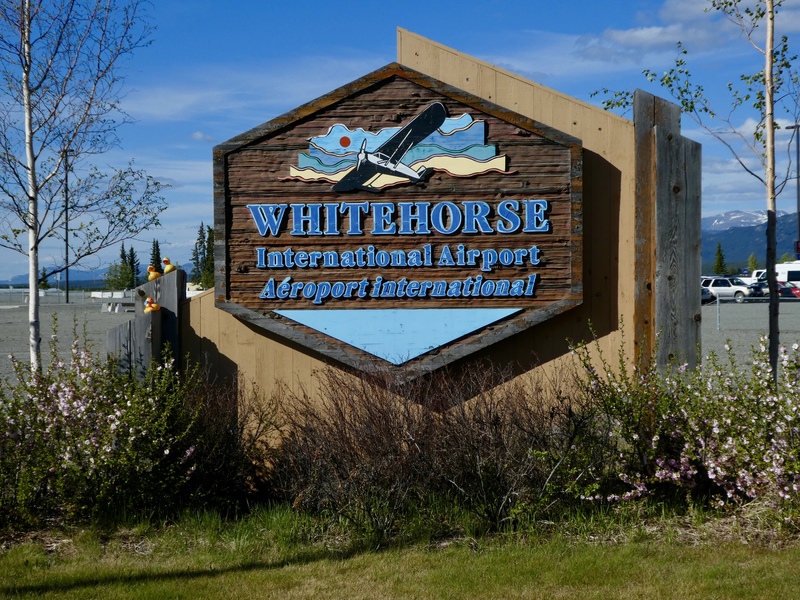 We are still in Whitehorse, Yukon Territory. We love it here. This morning we wandered around town, found a grocery store and purchased snacks for our room. 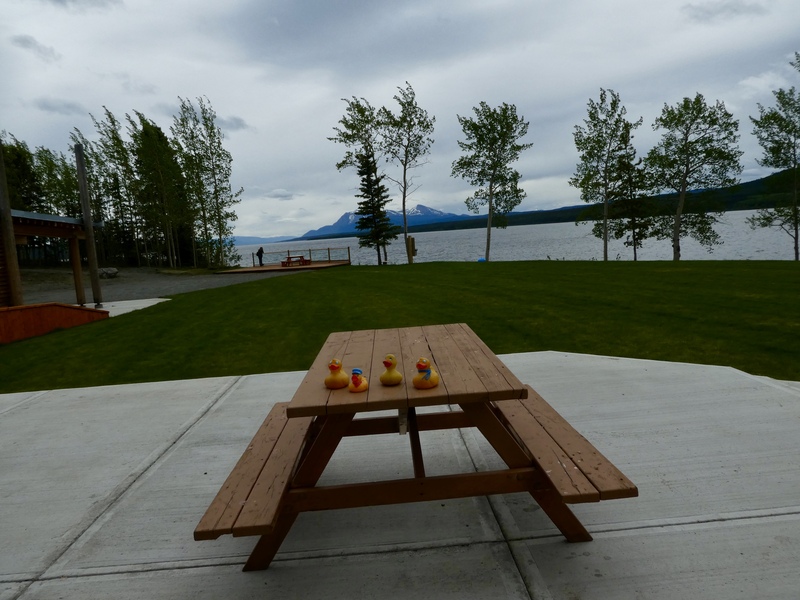 Yep…Humans and ducks love to snack. 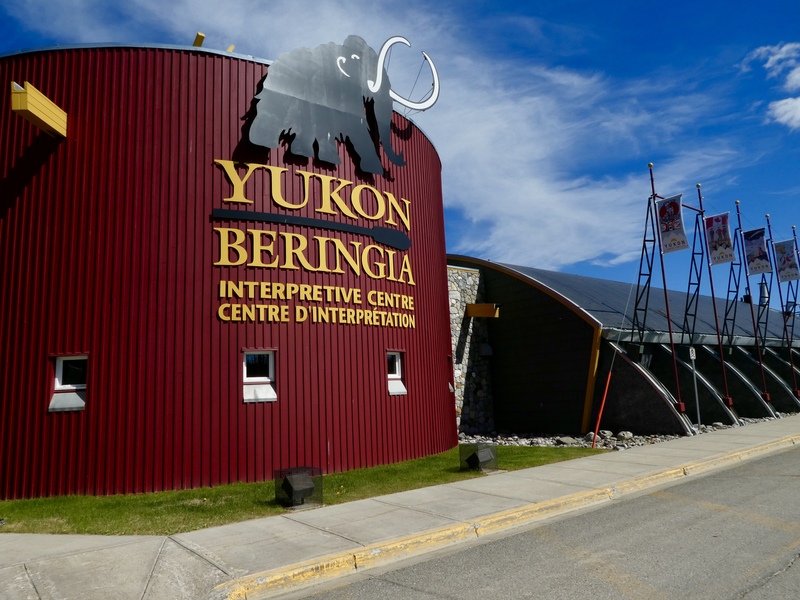 Now we are heading to Yukon Beringia Interpretive Center. This is a great cultural and historical place. 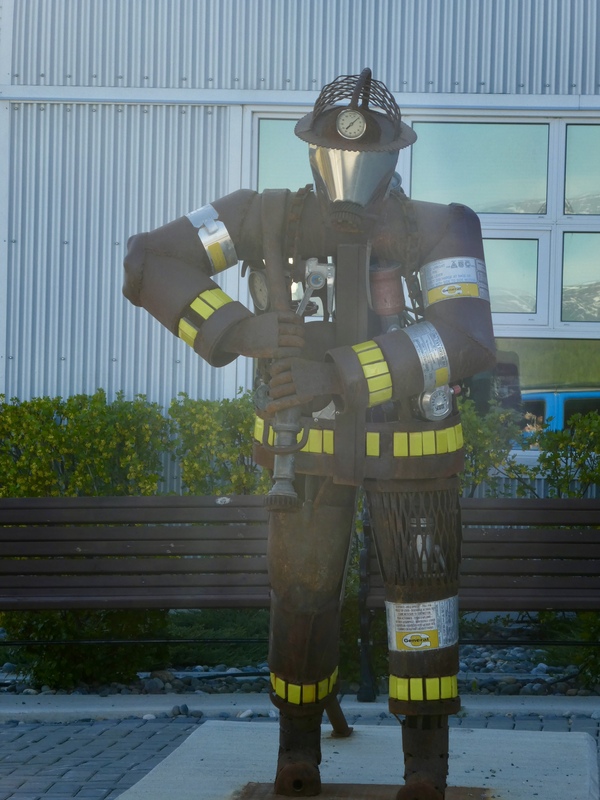 We didn’t go inside, we just looked at and admired the vast outdoor exhibits. Never enough time to do everything. Meet Woolly Mammoth. He used to live here. Doesn’t he remind you of a shaggy elephant with smaller ears? I think so. Oh look. 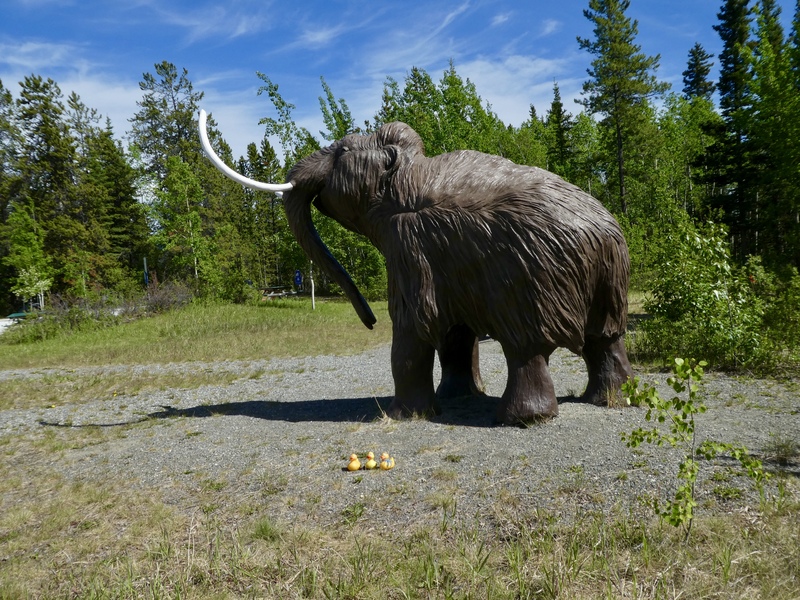 This Woolly Mammoth is closer to our size. 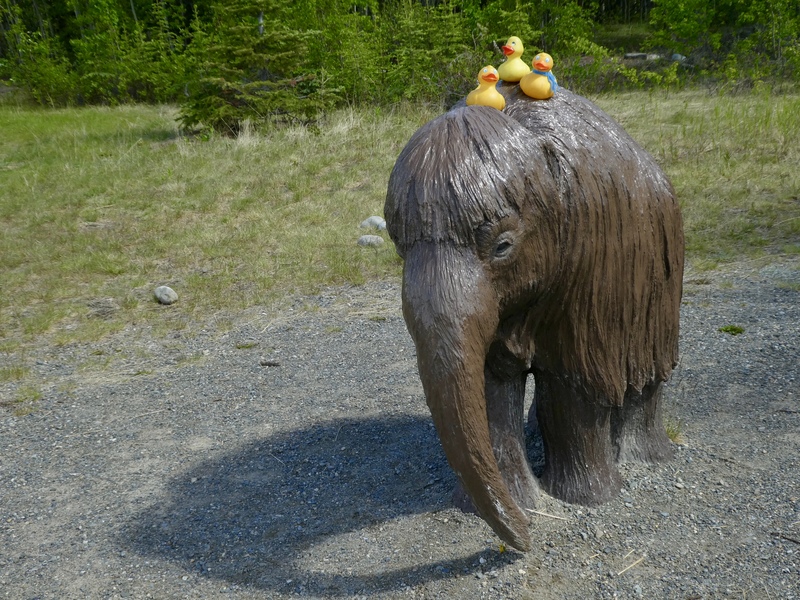 Can we go for a short ride little Woolly Mammoth? Apparently not. The sign says carcasses of Woolly Mammoth have been discovered here. Carcasses, complete with hair, skin and internal organs have been preserved in the Beringia permafrost. These giant animals lived here tens of thousands of years ago. They survived periods both hotter and colder than today’s temperatures. This is the biggest beaver we have ever seen. 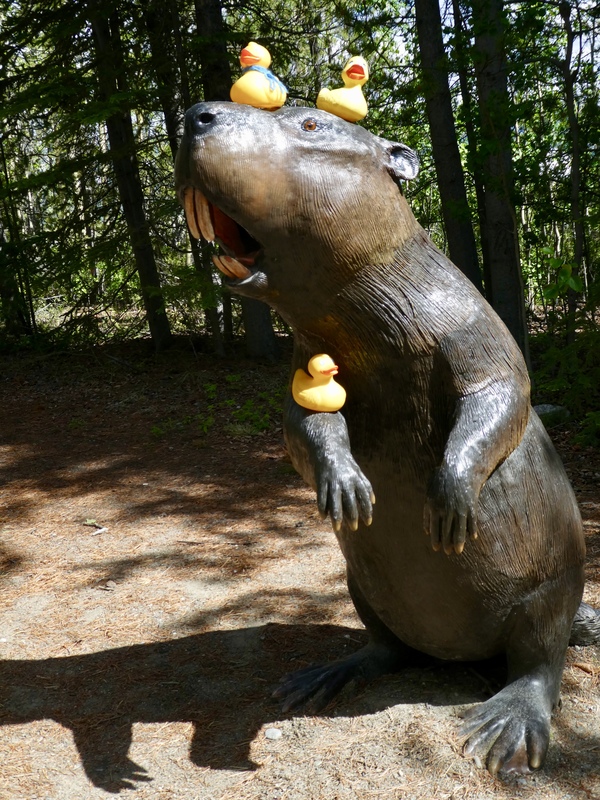 These giant beavers lived in the Yukon’s Old Crow basin region. They were 8 feet (2.5 meters) tall and weighed 480 pounds (218 kilos). These giant beavers roamed this area 130,000 to 60,000 years ago. Now what is this? A pay phone? Once very popular and common in the United States, it is rare to find a pay phone at home. Now most people carry a cell phone. 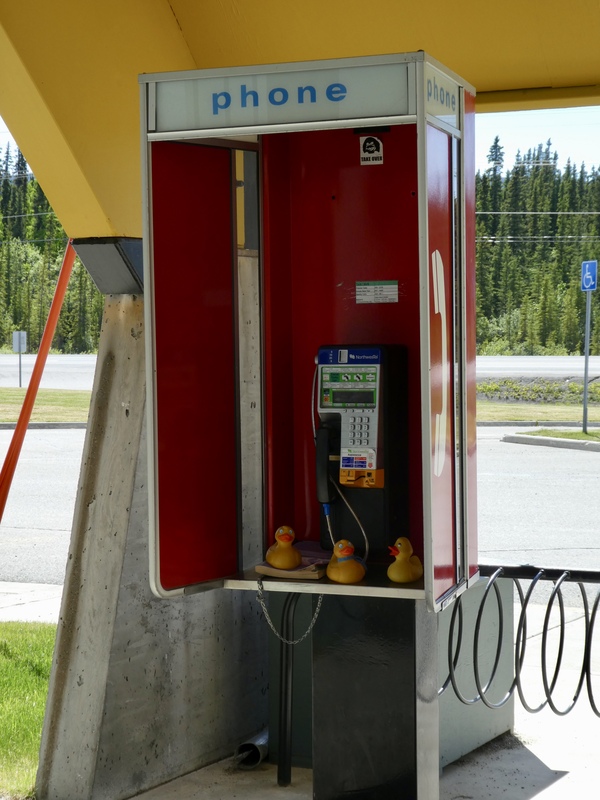 We like to see phone booths. Here is an Eskimo in his canoe, or kayak. 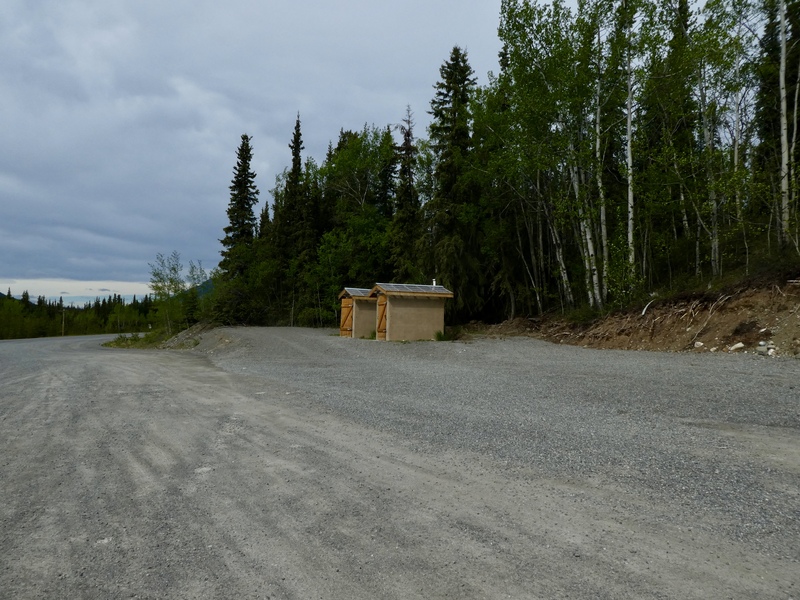 The common way to travel the Yukon River and other bodies of water during the summer when the water is not frozen. 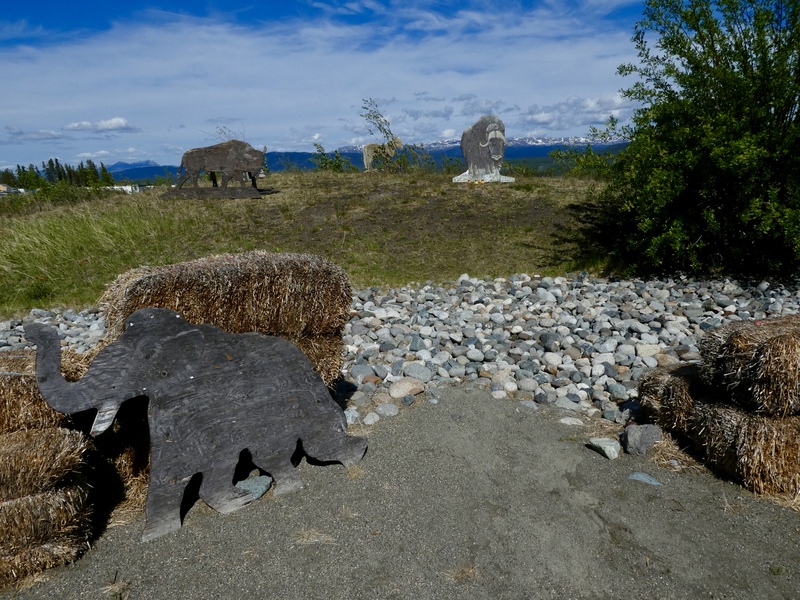 OK, what other animals formerly called this Beringia area home? We recognize this musk ox. We ducks are in front of him. He resembles Africa’s Cape Buffalo. 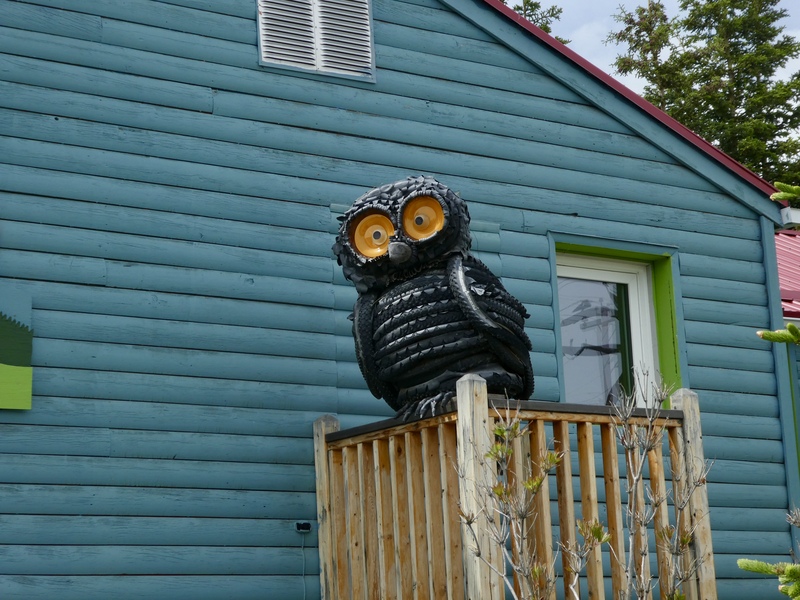 Notice that these animals all need heavy skin and thick coats to survive the brutal Yukon winters. We like seeing animals. 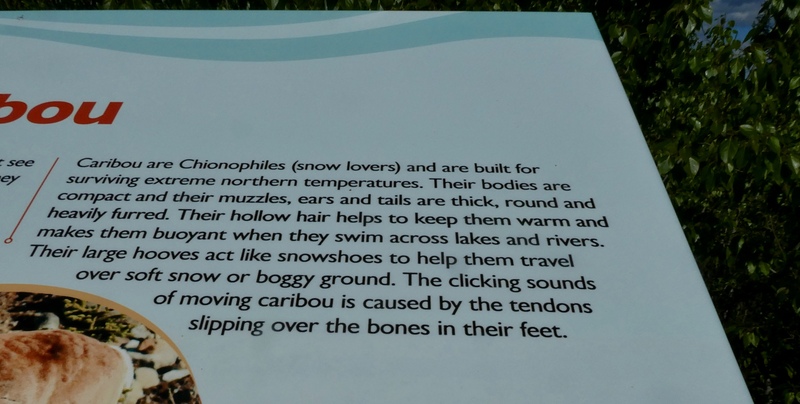 There are many signs here explaining the permafrost. The ground never thaws a short distance from the surface. 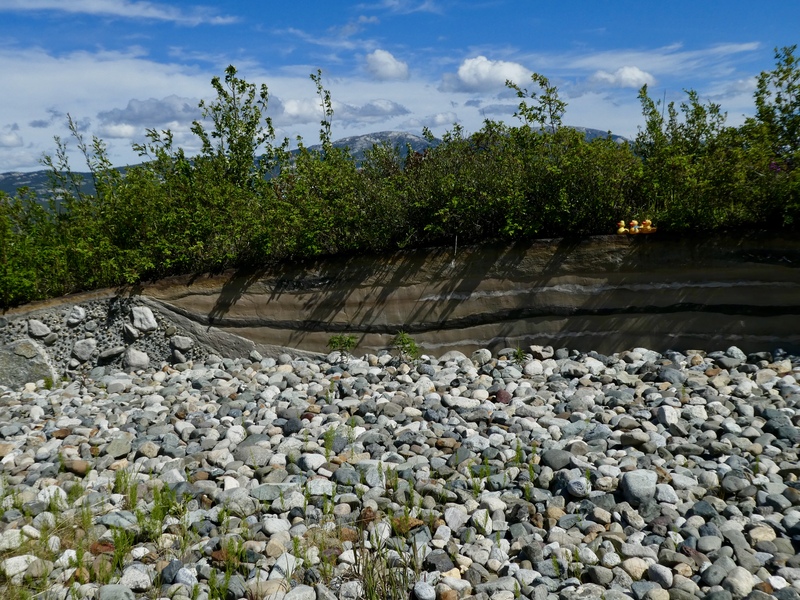 One result is surface water cannot penetrate the permafrost, so the soil above permafrost is quite wet. If the permafrost does melt, due to natural weather or human actions, the melting permafrost causes the ground to be unstable. This place makes us think about so many new things. Also, signs show how to read the story of climate change in riverbank layers. We can see several layers in this riverbank. These are natural layers, not things cemented together. So much to learn. So little time. 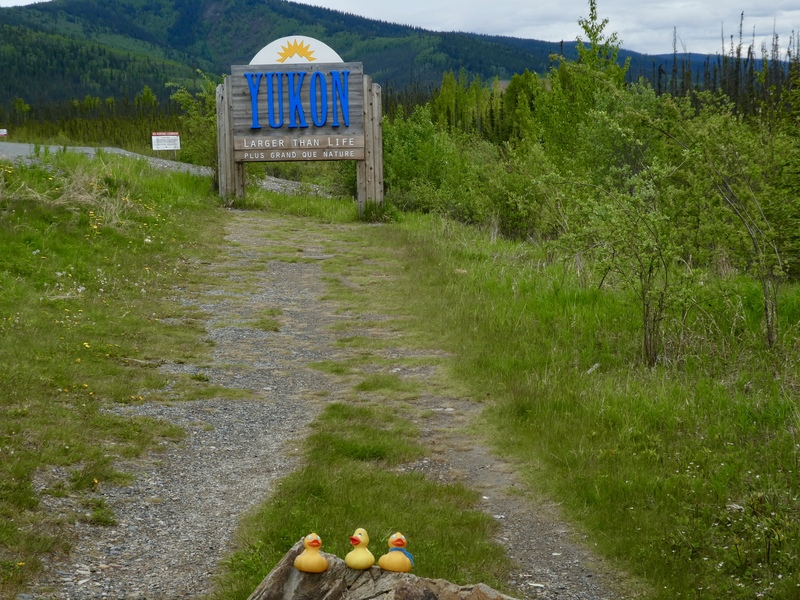 We are now headed to the Yukon Transportation Museum. We will show you what we find next time.